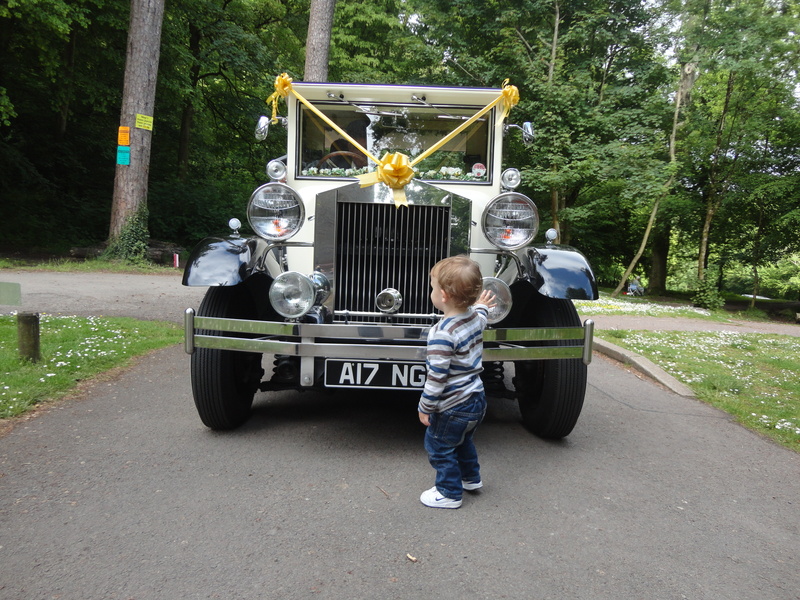 Castell Coch and Alfie chatting up the bride. 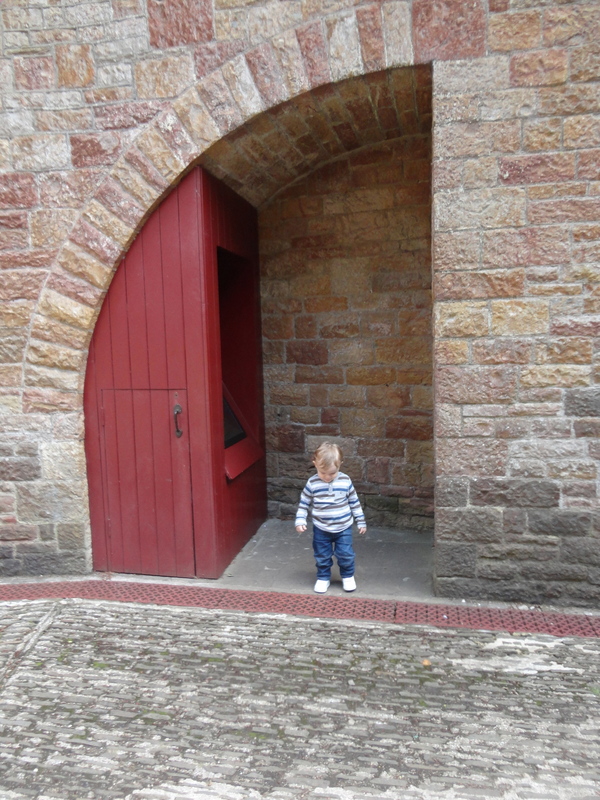 Meeting the Welsh Ladies’ Football Team and the promise of being a mascot when he is older. 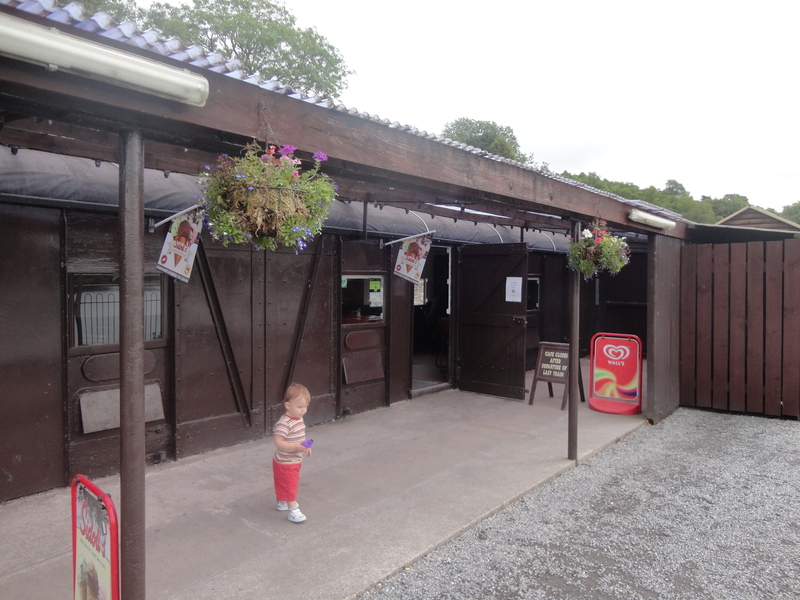 Finding a Wimpy in Caerphilly – that still amazes me! 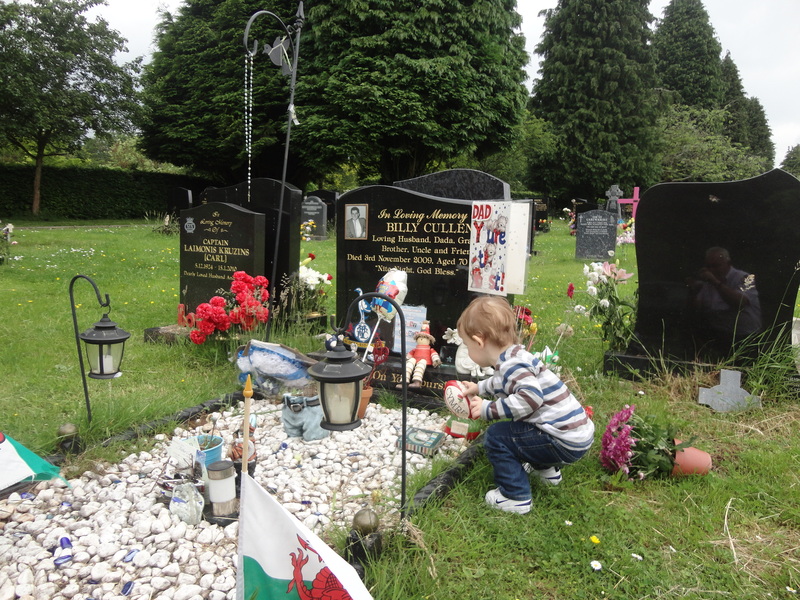 The vast number of people Alfie has made smile. Buying Alfie his first ever Clarks Pie. … and maybe best of all meeting the Cardiff City Football Team. 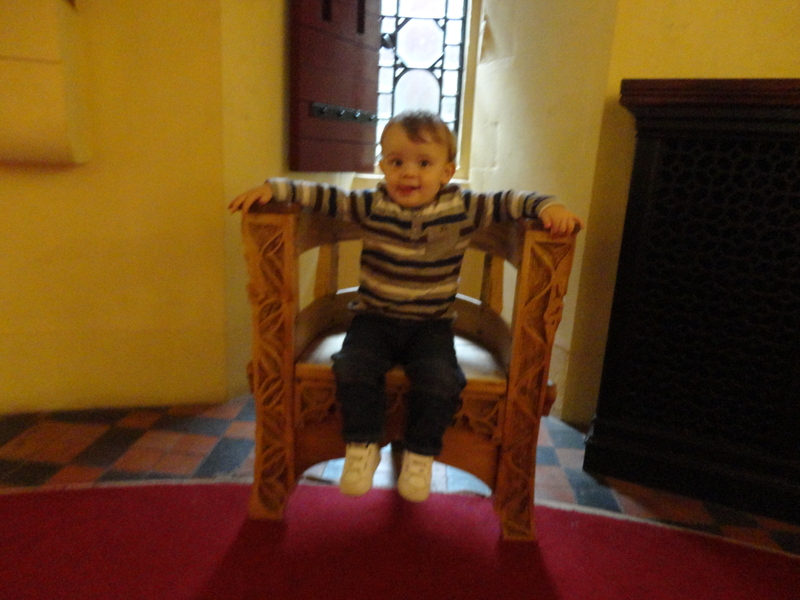 Each week has been exciting and, I hope, a treasure for Alfie as he grows up. I hope he reads them when he is older and who knows when he has a family of his own, I am sure his own kids will love reading about his Adventures with his chubby old friend. He already has his own little fan club of avid readers who eagerly await Fridays to see what the little fella has been up to. 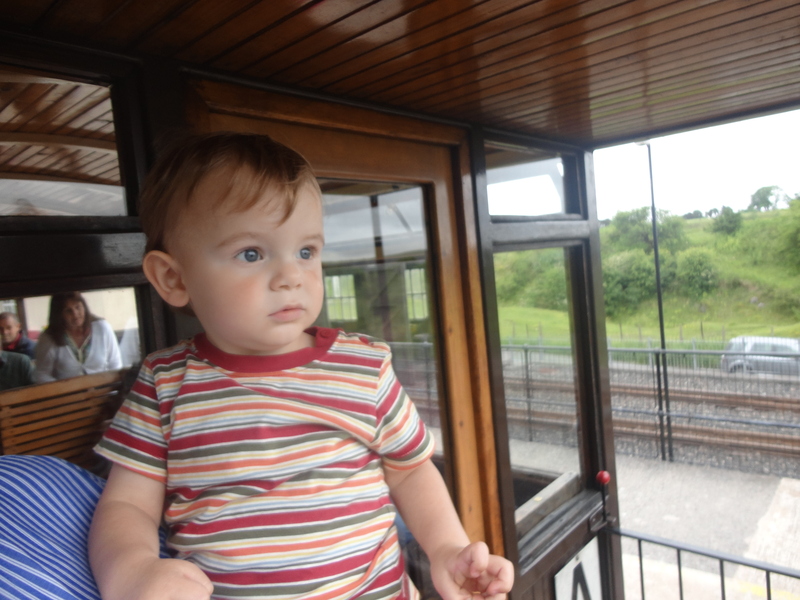 Today, as a special 25th treat, we decided on a trip on the Brecon Mountain Railways. 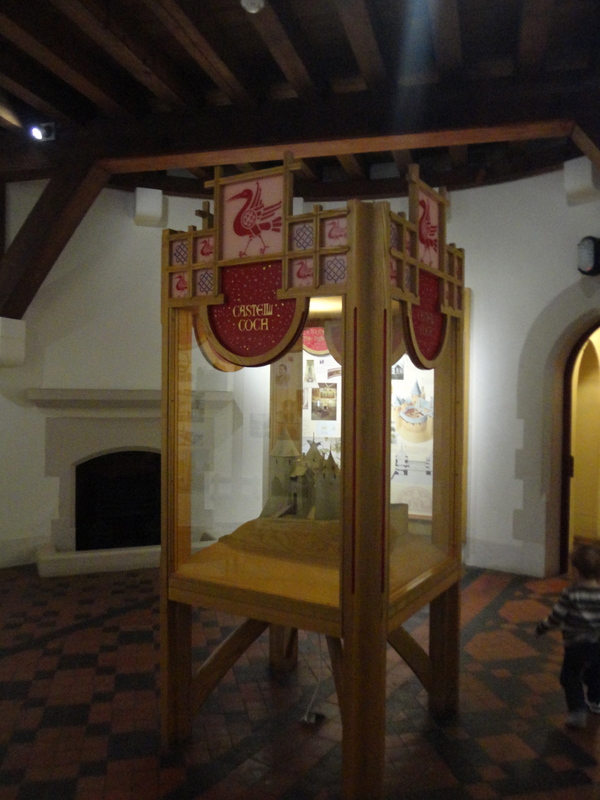 Like Castell Coch it’s a place we talk about often, advise visitors to enjoy, but rarely do ourselves. Things were about to change. We had a quiet start to the morning and had a little rest before the A470 called and the road to Merthyr. I had prepared his food for the day, changed a smelly nappy and smartened myself up before we left. The drive up the road to Pant in Merthyr was clear with a mixture of cloud and sun, but very little traffic. We sang together for a while before Alfie had a little snooze! 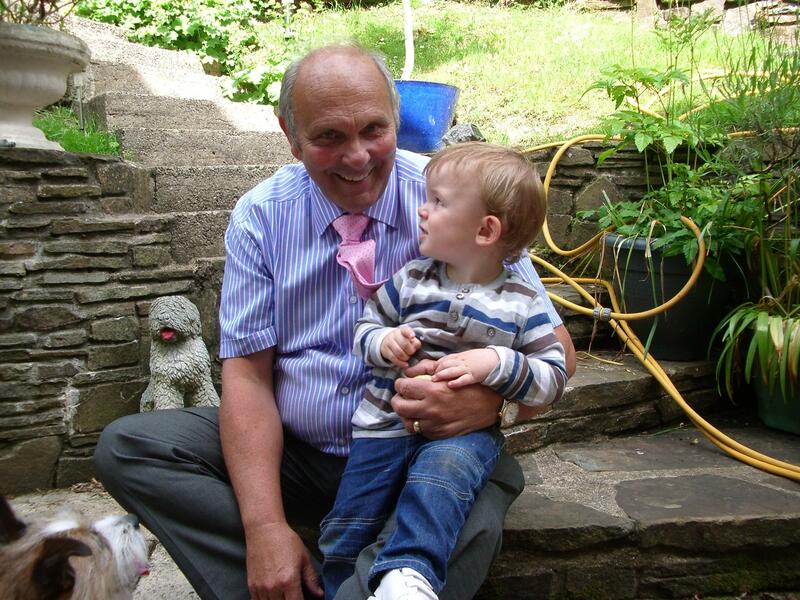 It was a journey I knew well from my days of living in Gelligaer and the part time job I had in Merthyr Motor Auctions, when we struggled as a family trying to live on a teachers’ wage in the 1970s. I worked with my big brother who has always looked out for me. They were tough days. 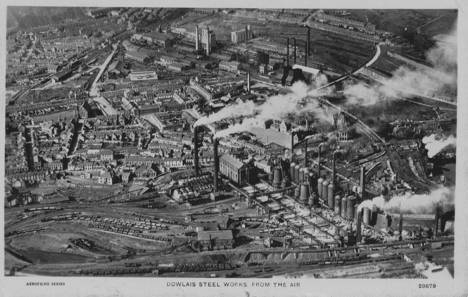 I love Merthyr with its magnificent history and Pant and Dowlais in particular. This was where the Motor Auctions were and a real host of characters lived and worked there. I will never forget, Smokie and Old Jim. I try and imagine the place full of factory chimneys and smoke during the time of the Iron Works. At one time it was one of the most famous places in the world. Hard to think that now, but the rows of ironworkers cottages all have their own story to tell. 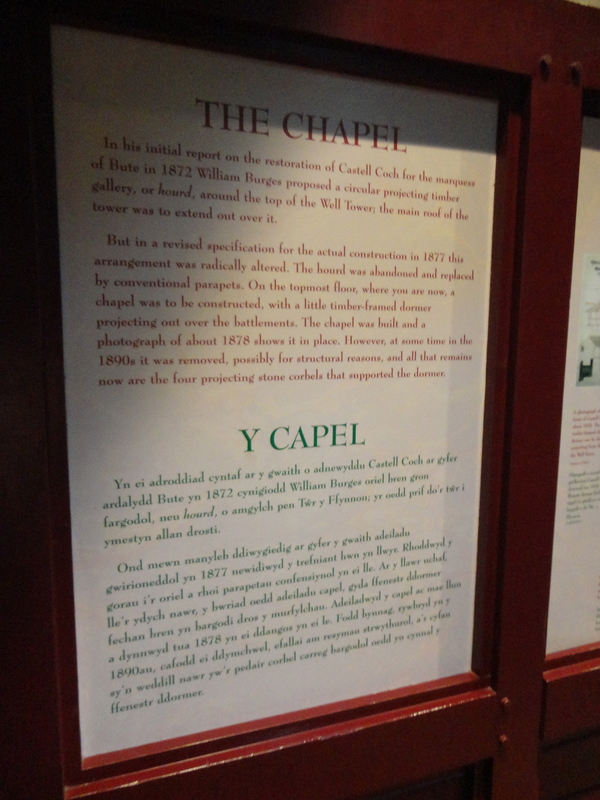 I wonder if there is such a thing as The Dowlais Local History Society? If there is, I might join. 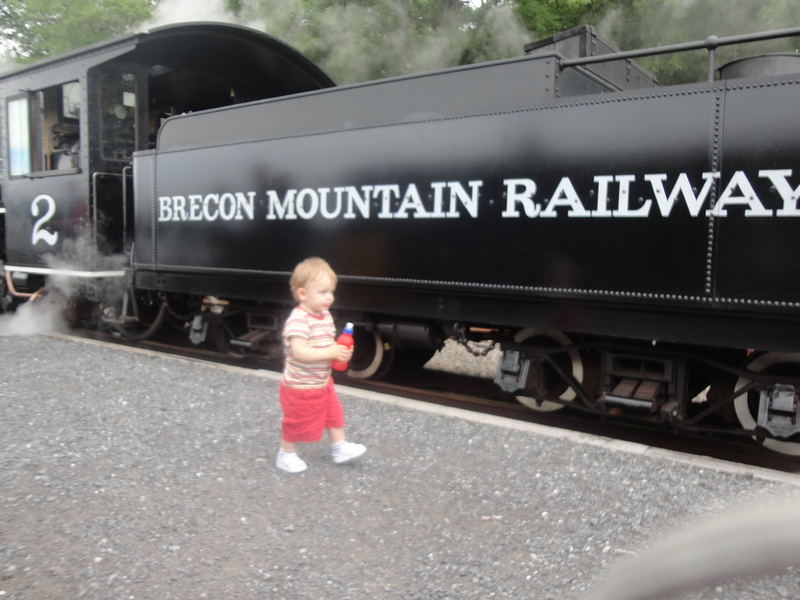 The Brecon Mountain Railway was conceived over 30 years ago when a search started to find a site to operate a steam tourist railway using various locomotives and equipment collected from Europe and further afield. 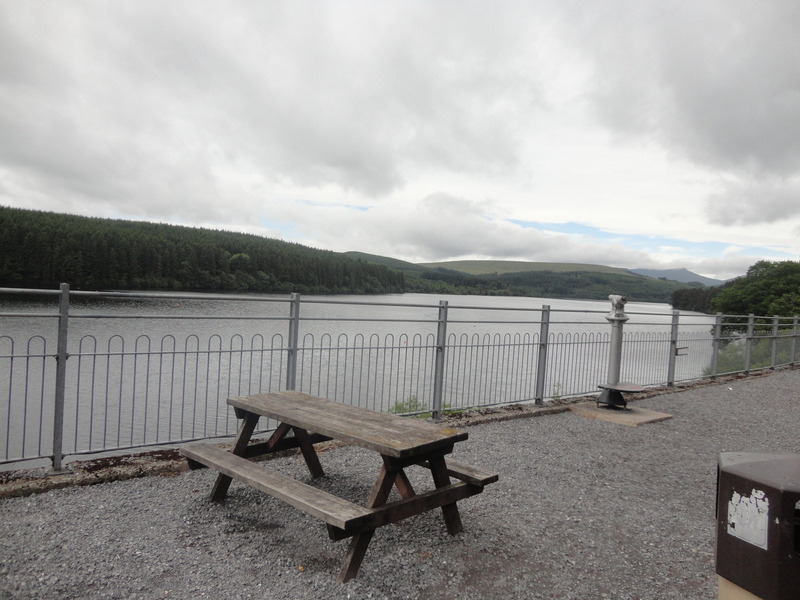 Merthyr Tydfil seemed ideal – located on the edge of the Brecon Beacons National Park with its beautiful mountain, lake and forest scenery. At one time it was the greatest iron-making town in the world and most of the earlier railways used iron rolled by its mills. 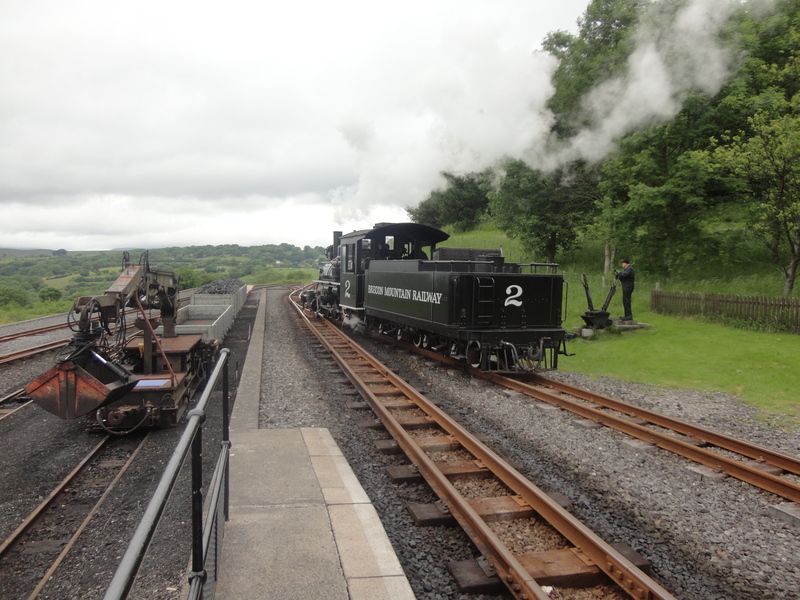 It also witnessed in 1804 the trial run of the Trevithick locomotive – the first steam railway engine. 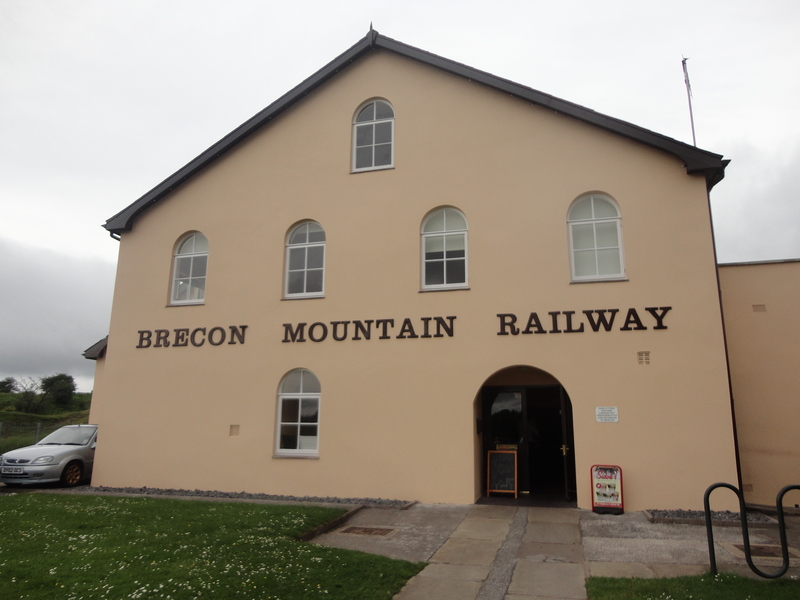 The site chosen was on the old abandoned Brecon and Merthyr Railway opened originally in 1859 and finally closed in 1964. 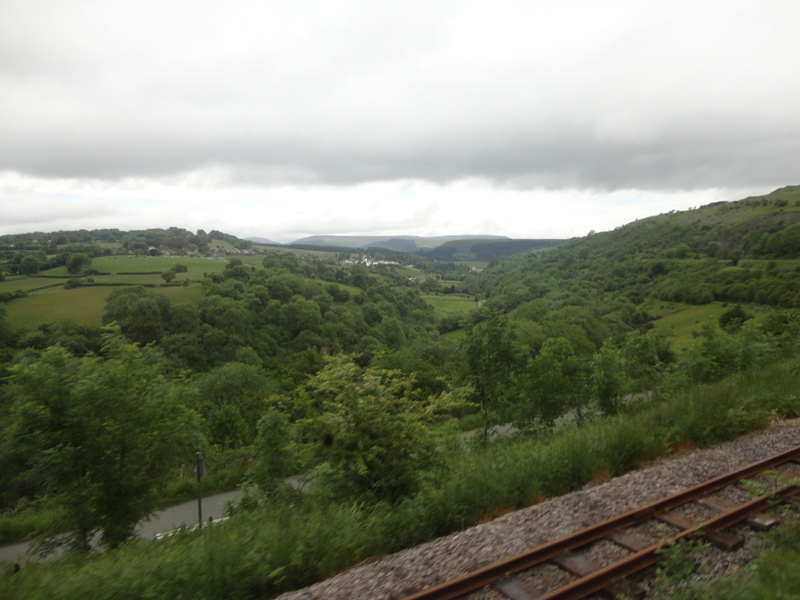 This Railway fought its way through the Brecon Beacons using steep gradients and the Torpantau tunnel which at 1313-ft above sea level is the highest railway tunnel in Great Britain. The 5.5 miles stretch between Pant and Torpantau seemed suitable but difficulties were soon found. 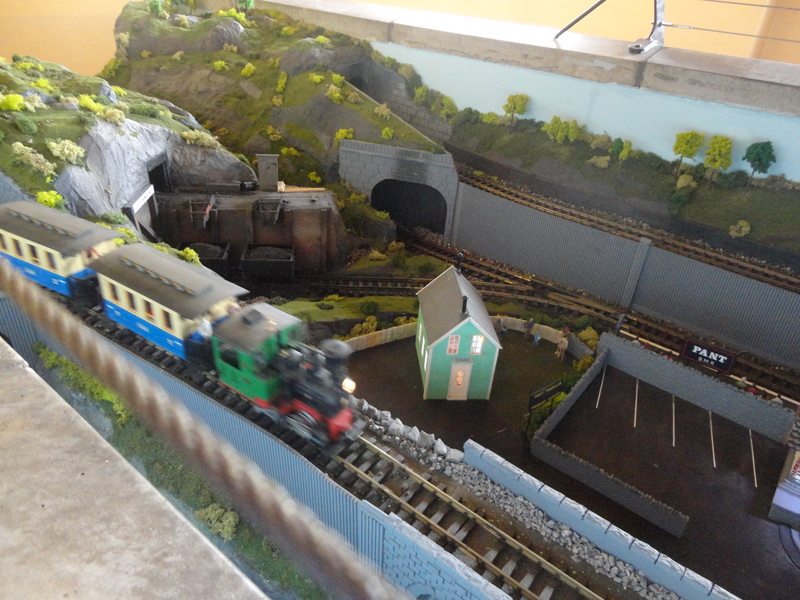 The scrap merchants had not only removed the track but also all the bridge girders and even the manhole covers. The ballast had been taken for road material and no buildings remained except for the shell of the signal box at Pontsticill and the station house, which was used as a sheep shelter. It was then discovered that the only part of the railway still in British Rail hands was one bridge abutment, which they readily agreed to sell! The remaining land had been sold off and it took between 5 and 20 years to obtain the rest from 12 different landowners. 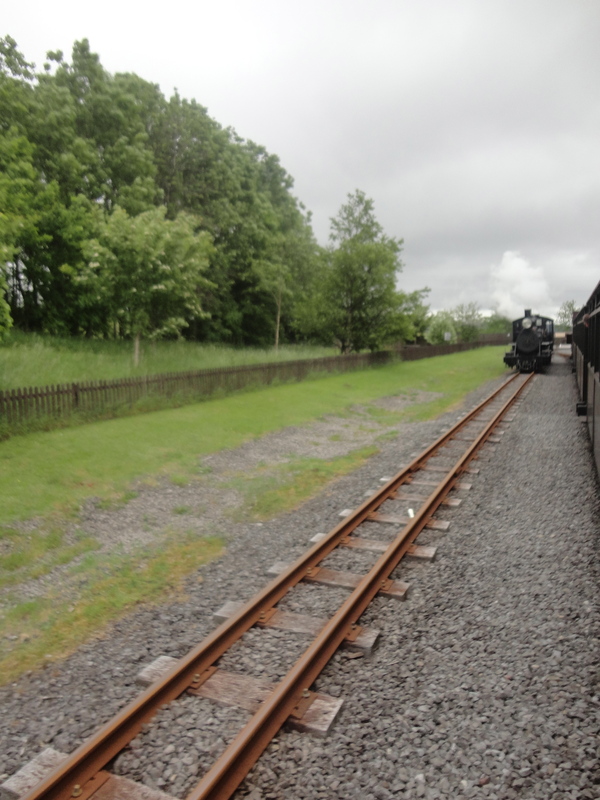 At Pant the old station was not available so adjoining land was purchased for a deviation. 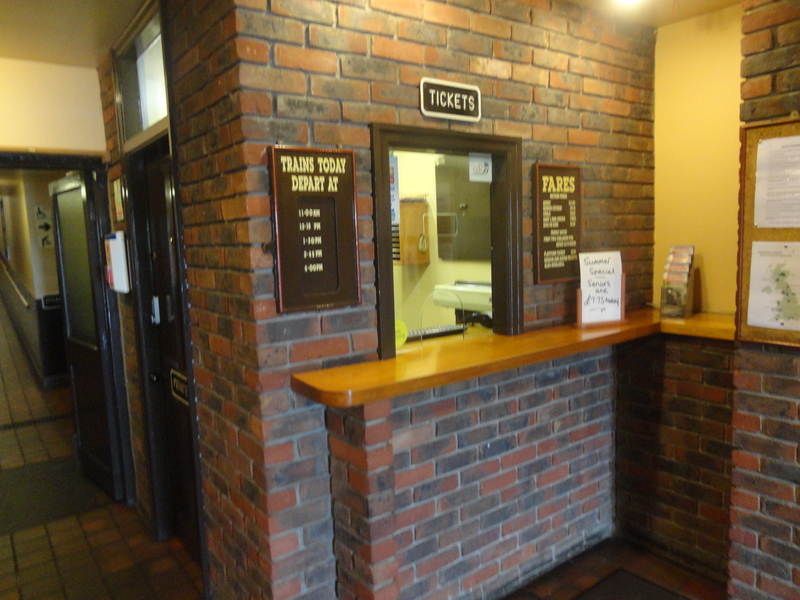 By 1978 the various planning and other consents had been obtained and construction started with the re-building of the Station House and conversion of the adjoining waiting room into a small workshop. Then came a tin shed for storage and work started on the repair and replacement of the 7 bridges between Pant and Pontsticill. Track laying was commenced in 1979, but delayed for two months whilst a huge landslide was filled with a row of demolished terrace houses from Merthyr Tydfil. 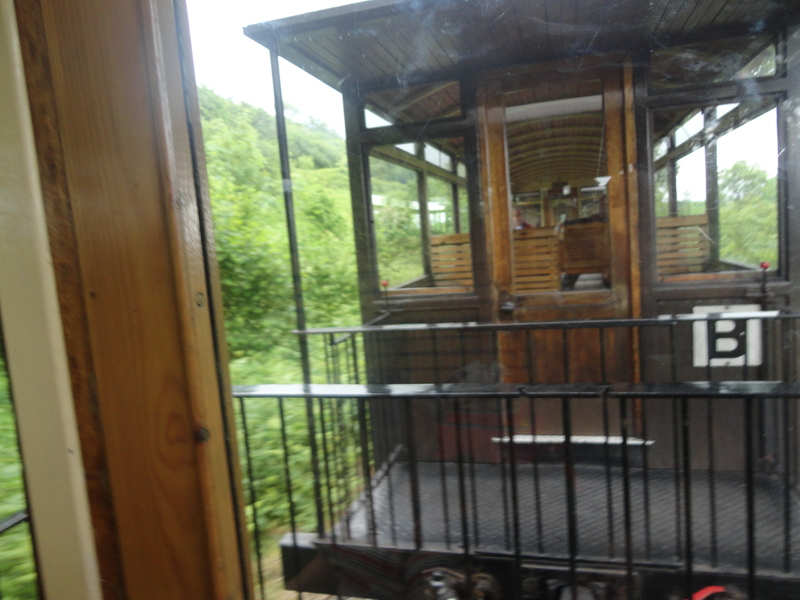 Meanwhile the first carriage had been built at Pontsticill and “Sybil” – a small slate quarry engine from North Wales had been prepared to haul the train. 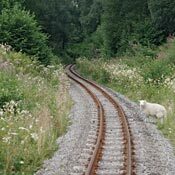 Track laying was completed late one summer evening in June 1980 and the railway opened to traffic the next day. We found a place to park, left the puschair in the boot and started adventuring. 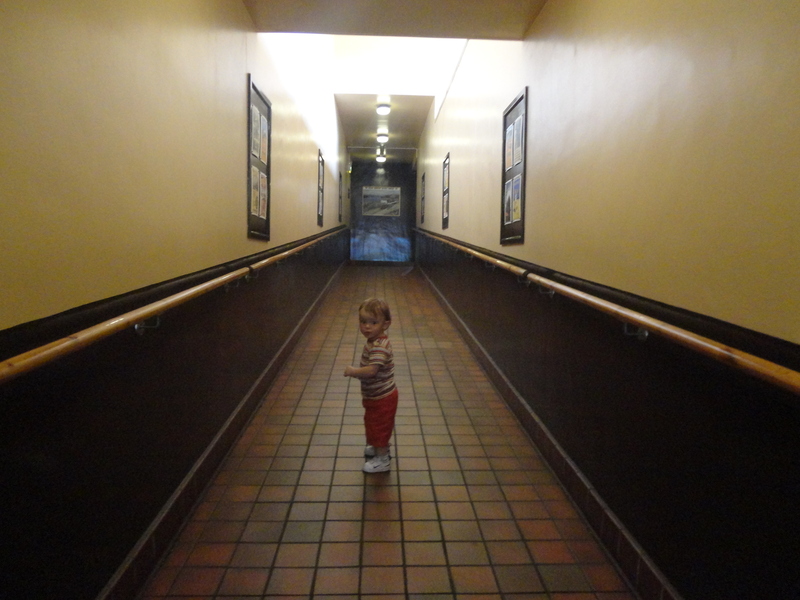 We made our way in and straightaway I thought… that’s a good sign. 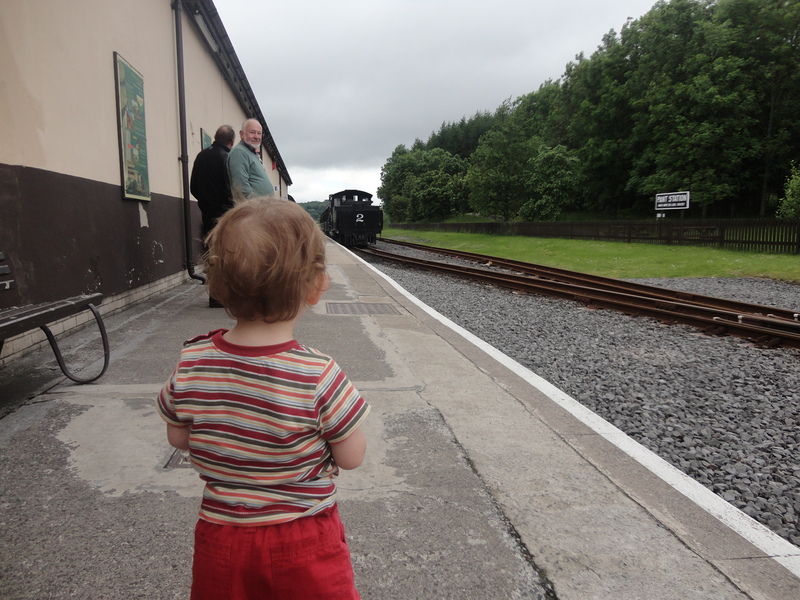 I paid my dues; Alfie was free, and headed for Shunters the station teashop. 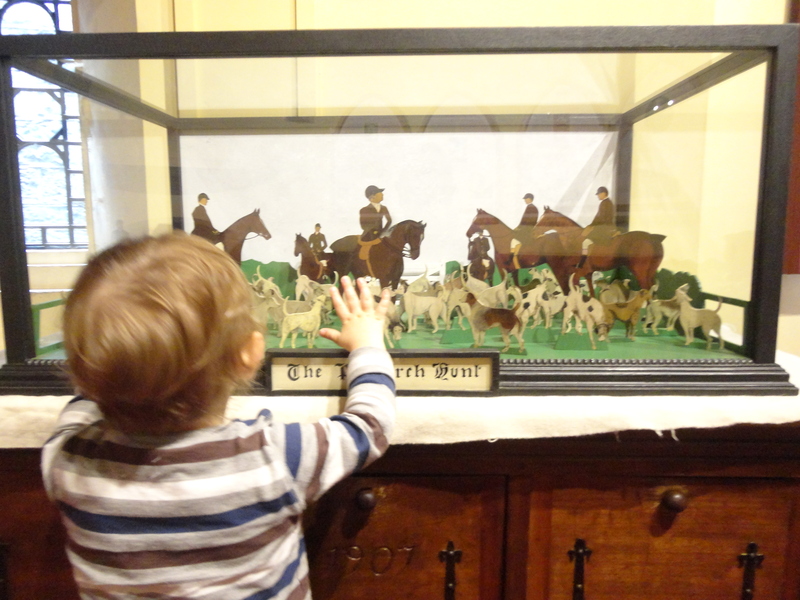 Alfie has developed a healthy interest in teashops over the past 25 Fridays. He is learning well. I had a pot of tea and we shared a toasted teacake. 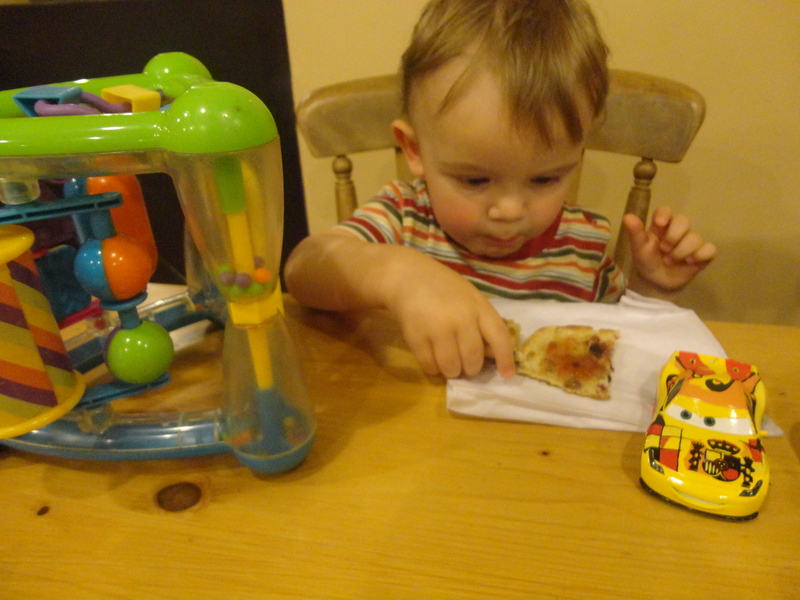 On his second piece Alfie found it was covered in jam and proceeded to remove all the jam first, followed by the teacake! Lunch would come later. After enjoying this time together, we made our way up to the platform. 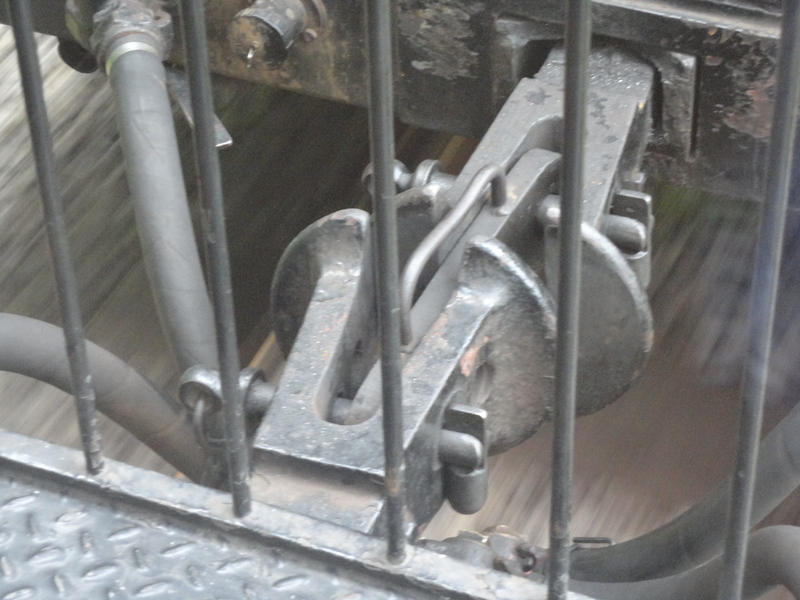 As we did we had to pass the Railway workshops, full of heavy machinery. There was a sign saying ‘Beware of heavy plant!’. I looked around expecting to see a 20-foot aspidistra or a 30 stone Peace Lily, till I realised what the sign actually meant. 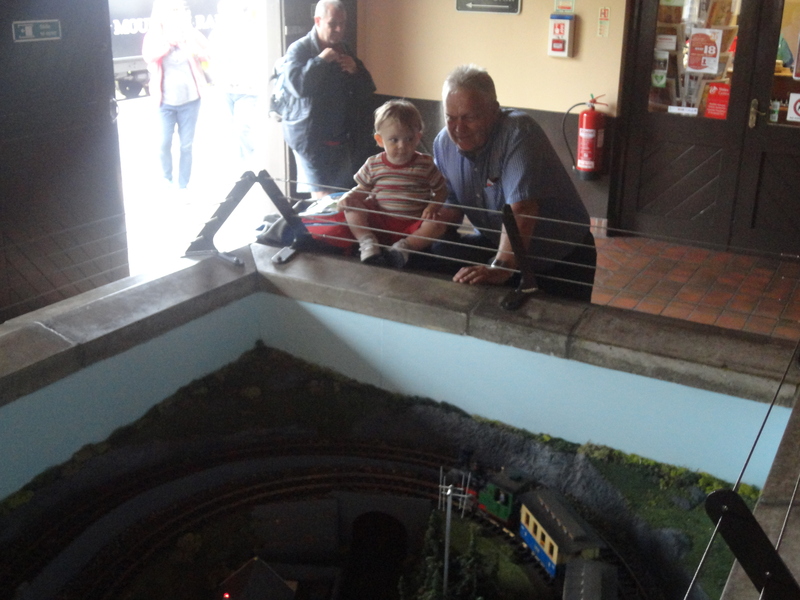 Alfie loved this and pointed excitedly at all the large machines. However, greater excitement was to follow. 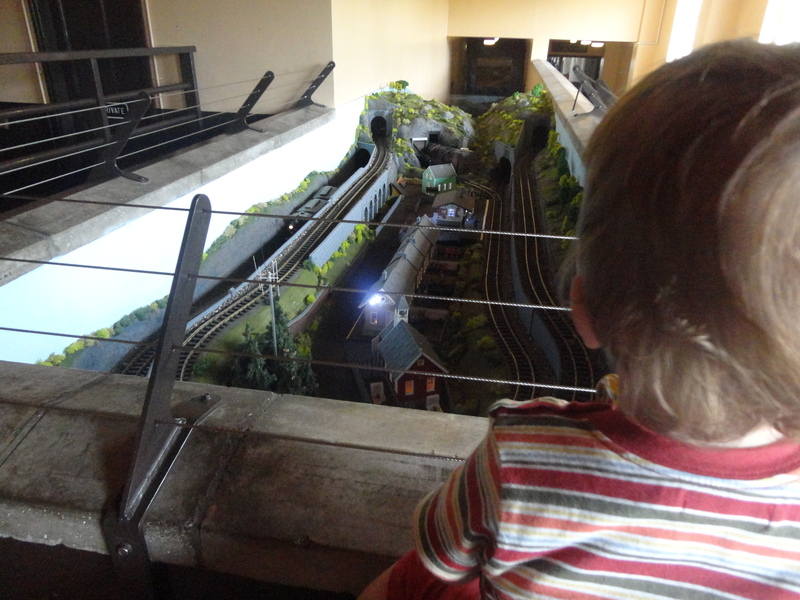 At the top of the ramp in the station waiting room, there was a huge model train display. 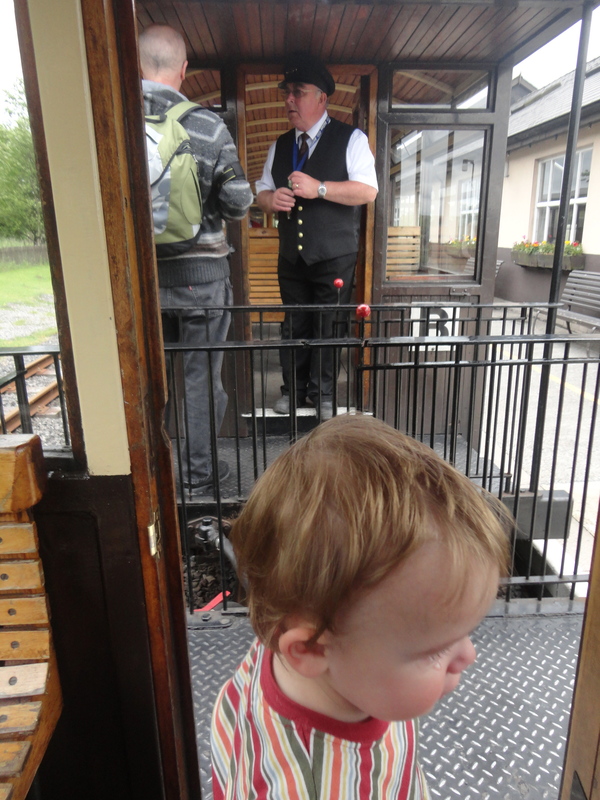 Alfie was over the moon and spent a long time shouting ‘ Choo choo’ over and over again. 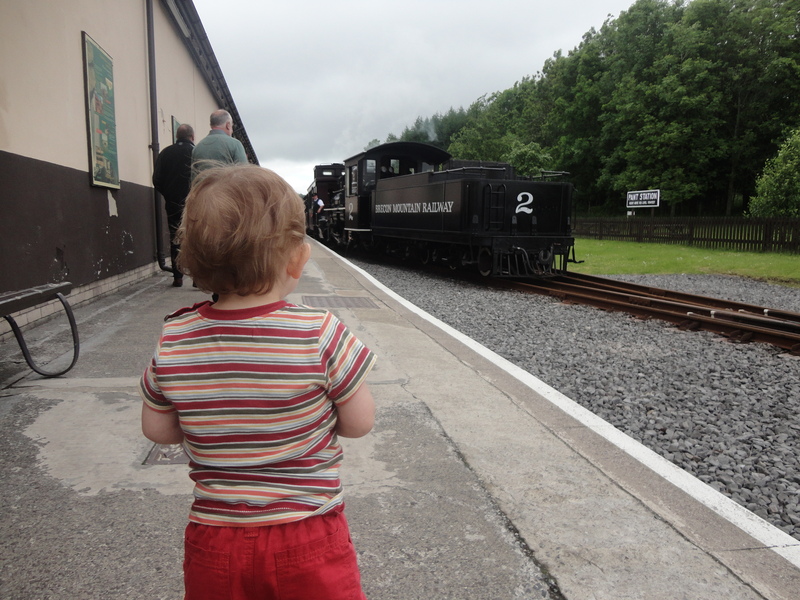 Why does very child in the world say Choo choo whenever you mention a train? 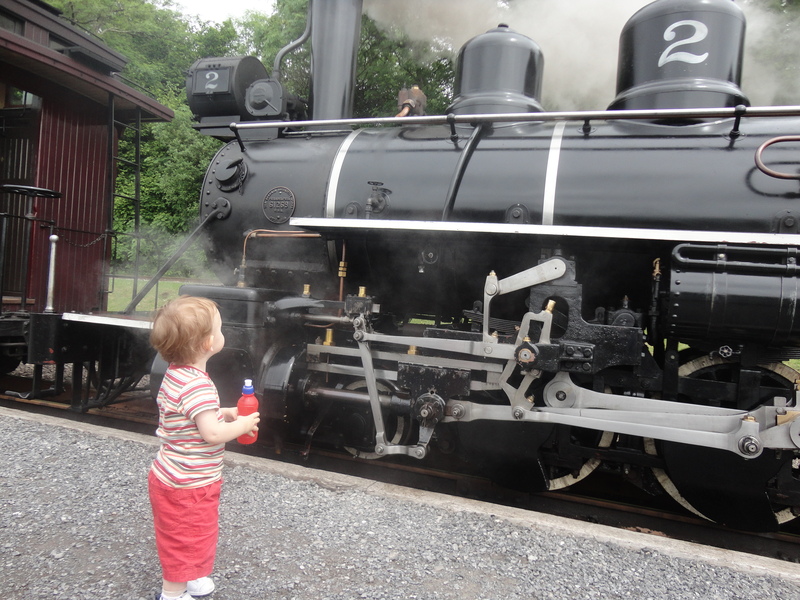 I guess it shows the power and majesty of steam trains. 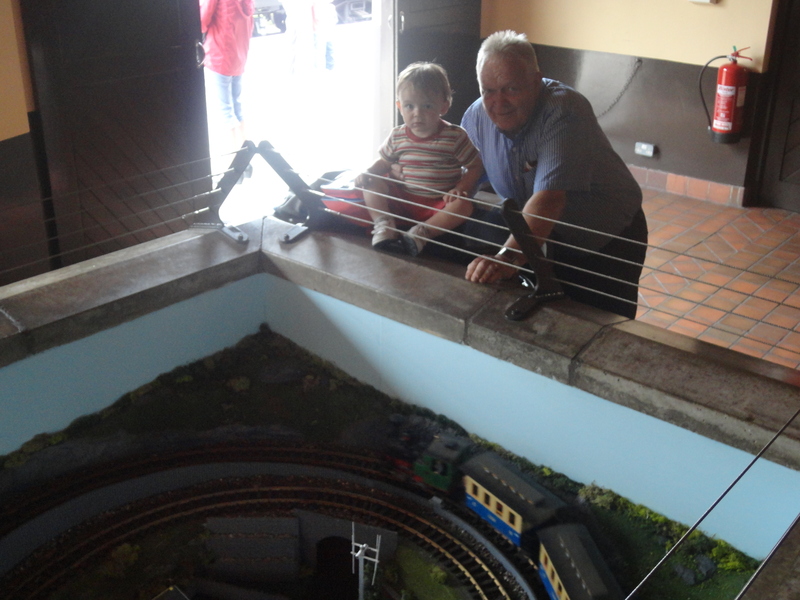 It was a great display and I even mumbled a few choo choos of my own, pretending to encourage Alfie. 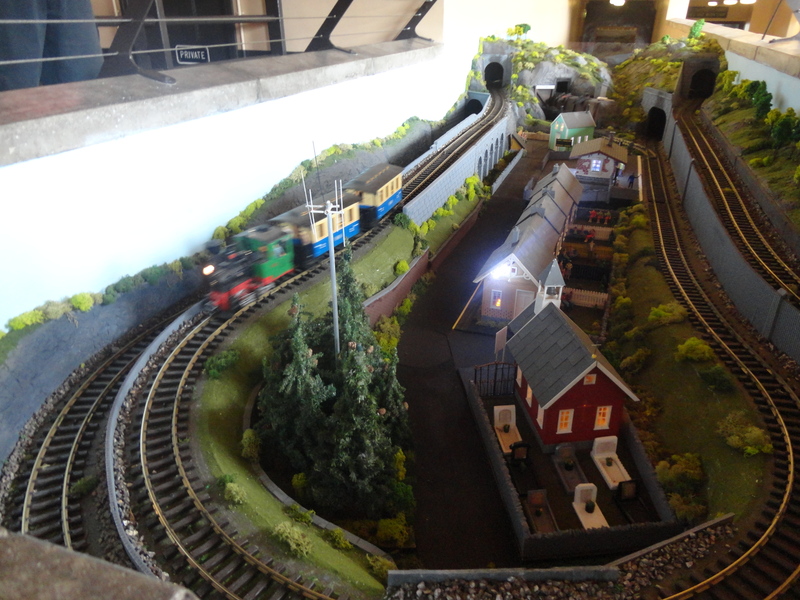 When Aunt Bes gets married I wonder if the Blessed Lady will let me build a train display in her room… I’ll choose the moment carefully! We stopped looking only when excited chattering announced that the train was pulling into the station. What followed I will never, ever forget. 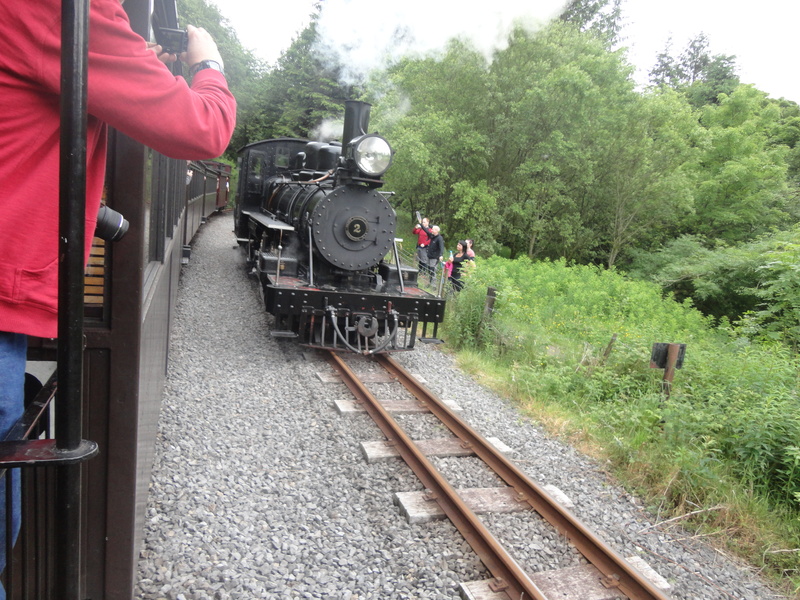 As we walked on to the platform the train was just pulling in. Alfie’s mouth dropped open and his eyes widened and threatened to fall from their sockets. He was spellbound! 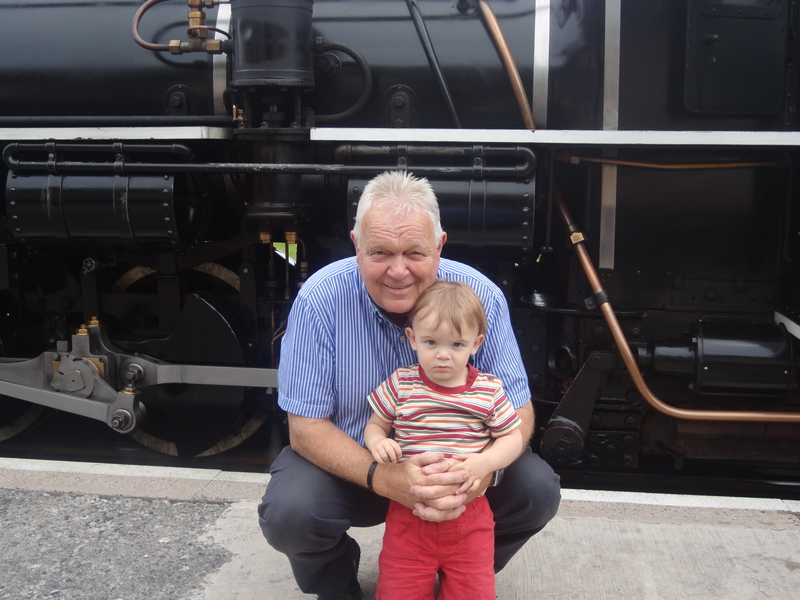 I had him hooked; he will be a steam train lover all his life from this day on. I’m a steam train, big and tough, Riding steel rails, hear me chuff; Running on my railroad track, Smoke is steaming from my stack. Down the line my big wheels roll, Engineer puts in the coal, In my boiler, water’s poured, “TOOT!” the driver pulls the cord. Every trip my friends are new, People wave when I come through; Always happy, never gruff. Up the hills I huff and puff. Clickety-clack the wheels all sing, Part of history, I’m the King; Cross the land from east to west, Want to ride? Well, be my guest! 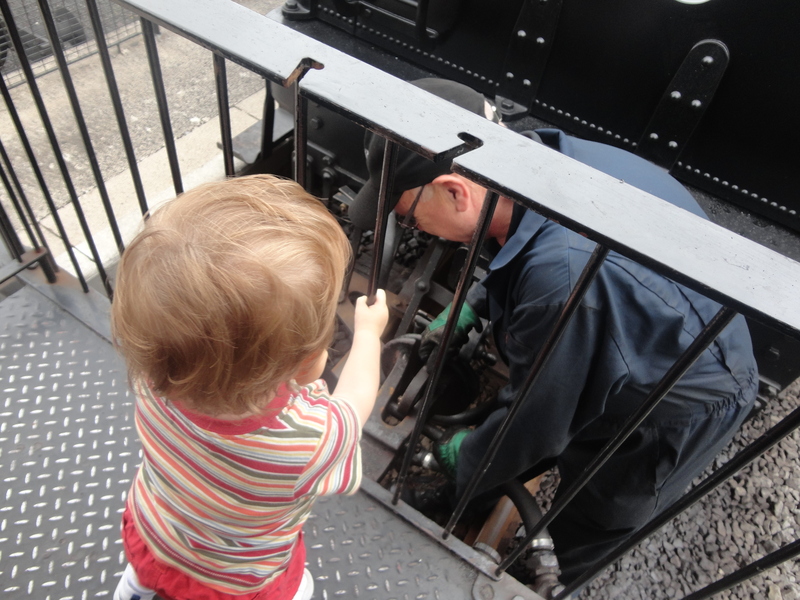 Nice clean carriages, painted new, Hear me whistle, just for you; Buy your tickets, climb inside, Let’s go for a steam train ride! 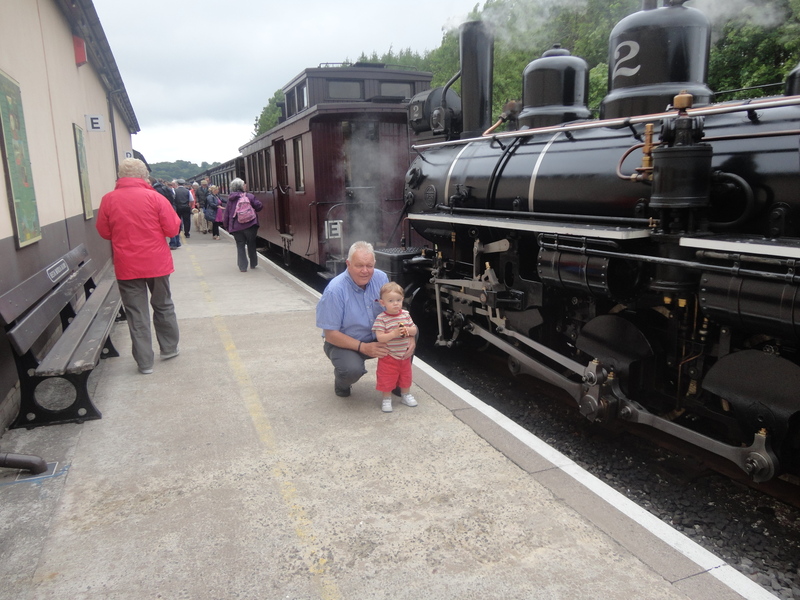 I made sure Alfie had not grazed his chin on the platform when his jaw dropped and after watching the engine uncouple and move to the front of the train we got on and waited for our journey to begin. 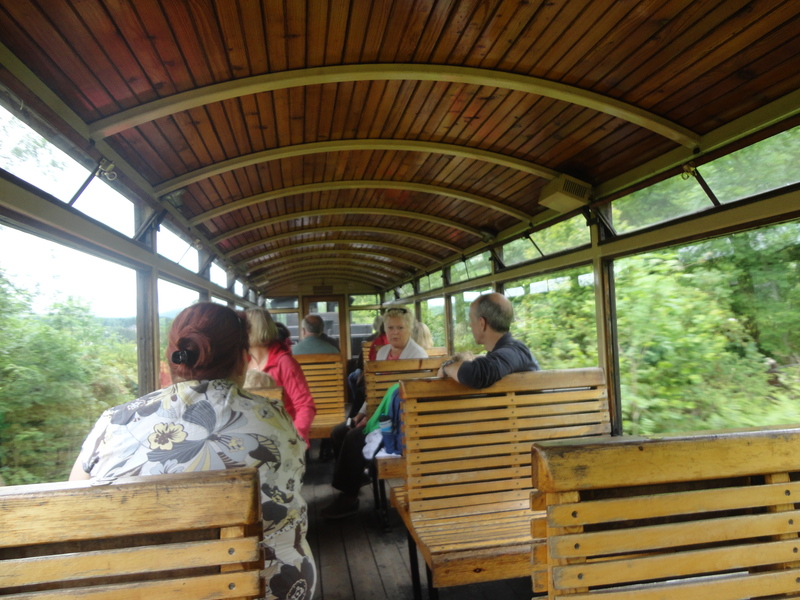 We shared the carriage with a few other people, mostly retired by the look of them. 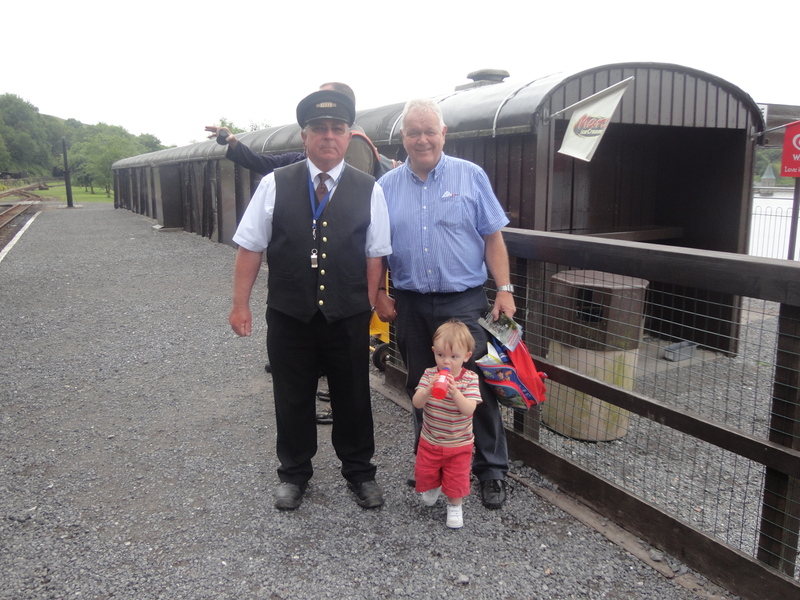 Alfie continued to shout Choo choo! without stopping. 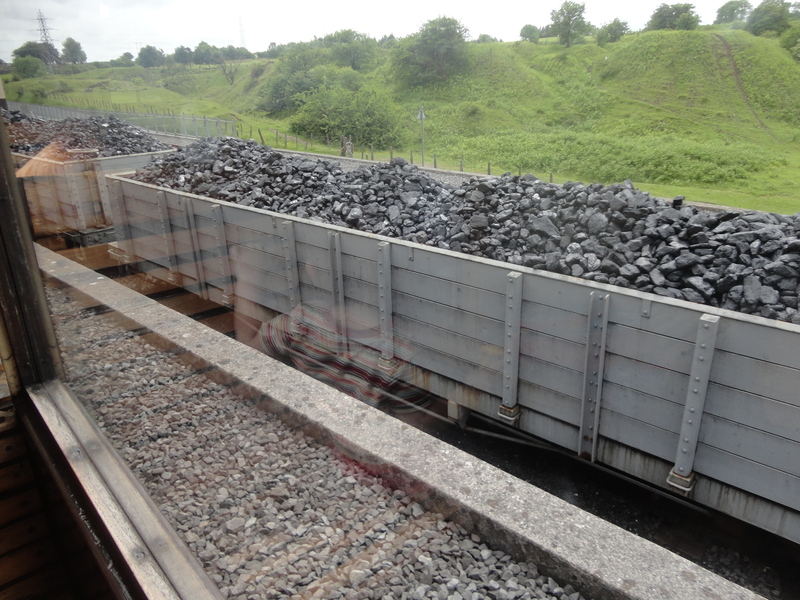 We pulled away and passed some coal trucks heavily laden with their black cargo evoking memories of a bygone age. 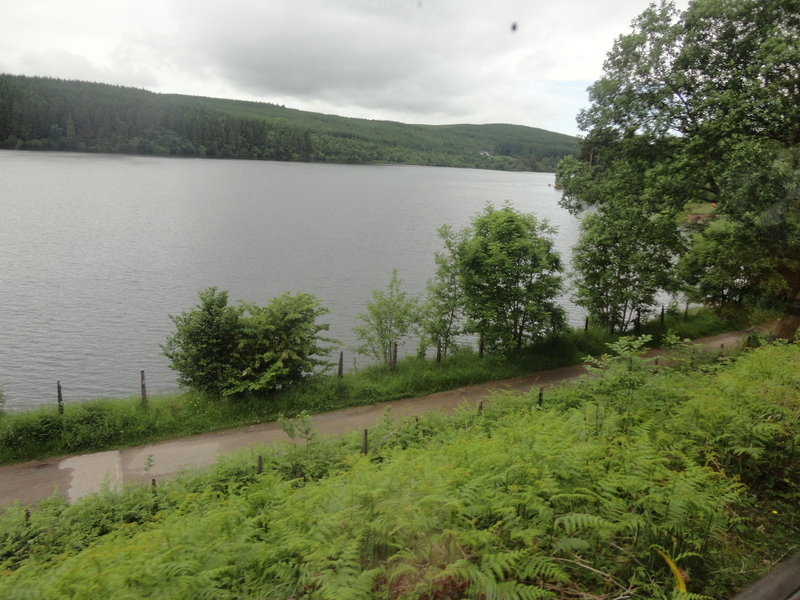 We passed through some beautiful countryside before the reservoir at Taf Fechan came into view. 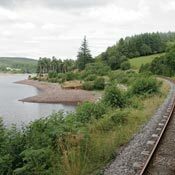 As the train approaches Pontsticill Station the Reservoir Dam can be seen. 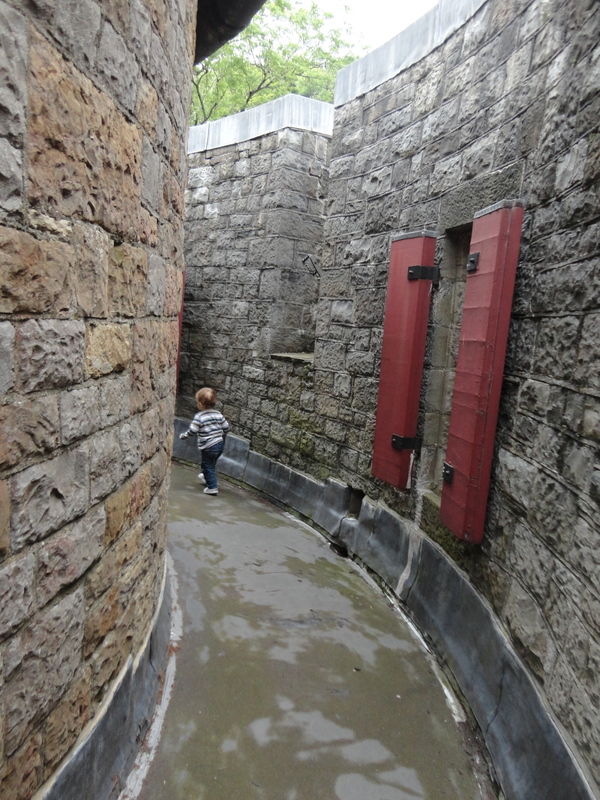 The Reservoir was completed in 1927 and can hold 3,400 million gallons of water. 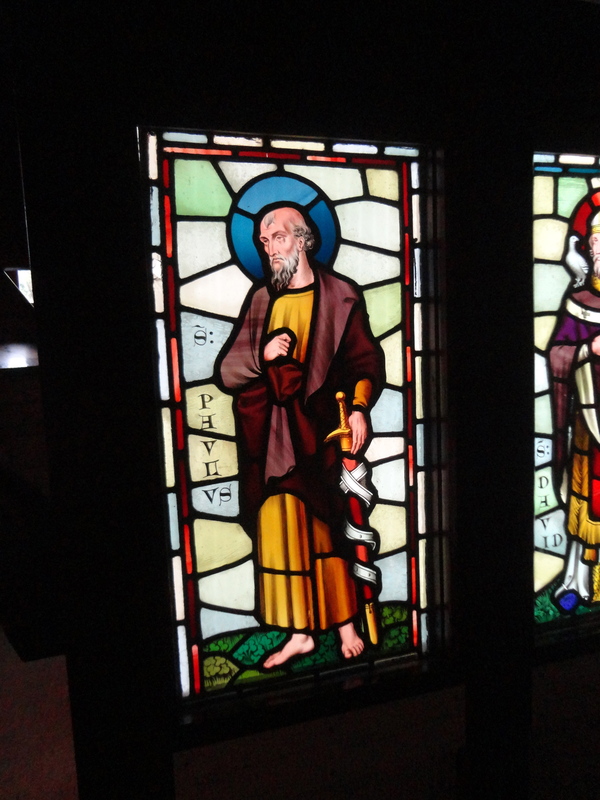 The water flooded the vicarage and 15th Century Capel Taf Fechan, Bethlehem Congregational Chapel, some cottages, smallholdings and land belonging to eight farms. In times of drought the remains of some of these buildings appear above water level. On the valley floor below the dam a new water treatment works has been completed. 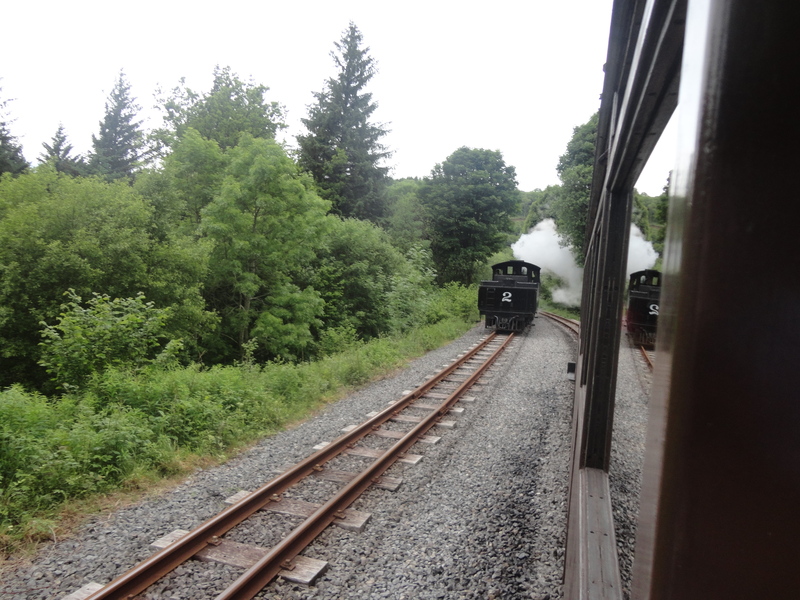 Soon the train passed, without stopping, through Pontsticill station. 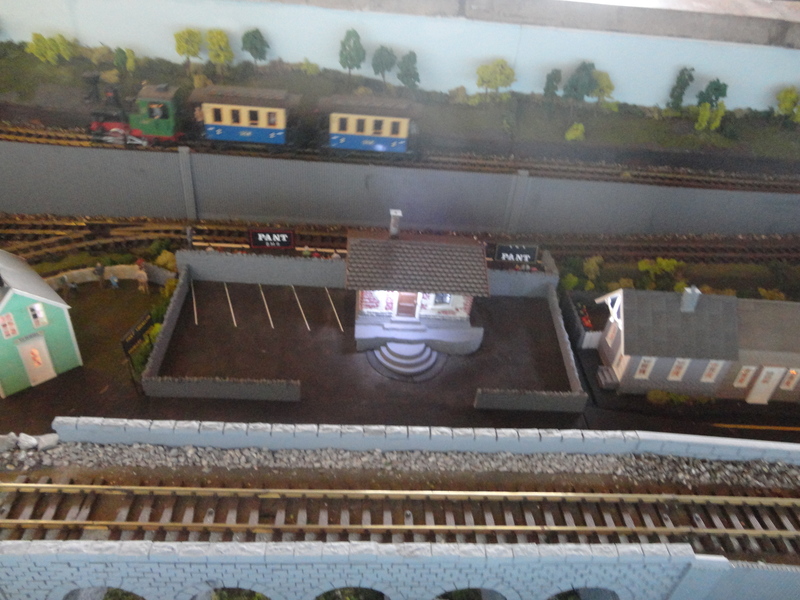 The original signal box could be seen alongside Station House. 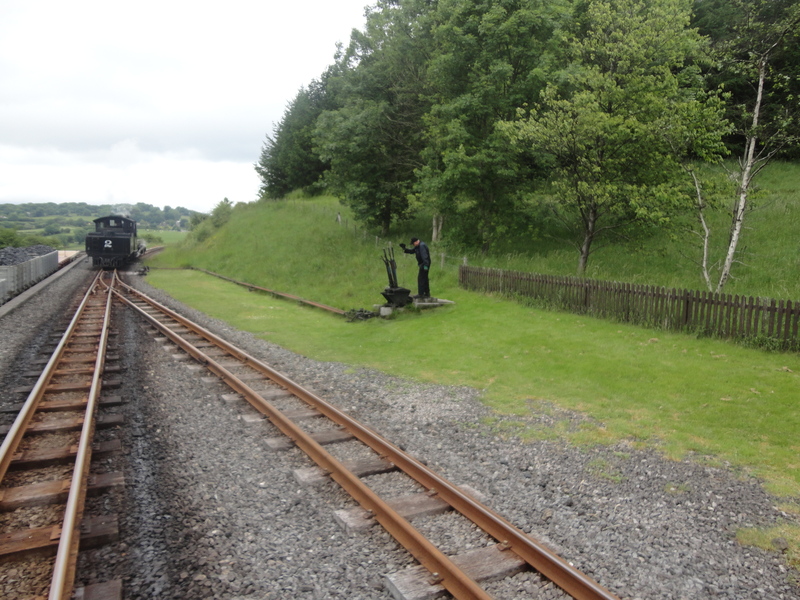 The grassed area to the right of the signal box was the site of the old turntable. 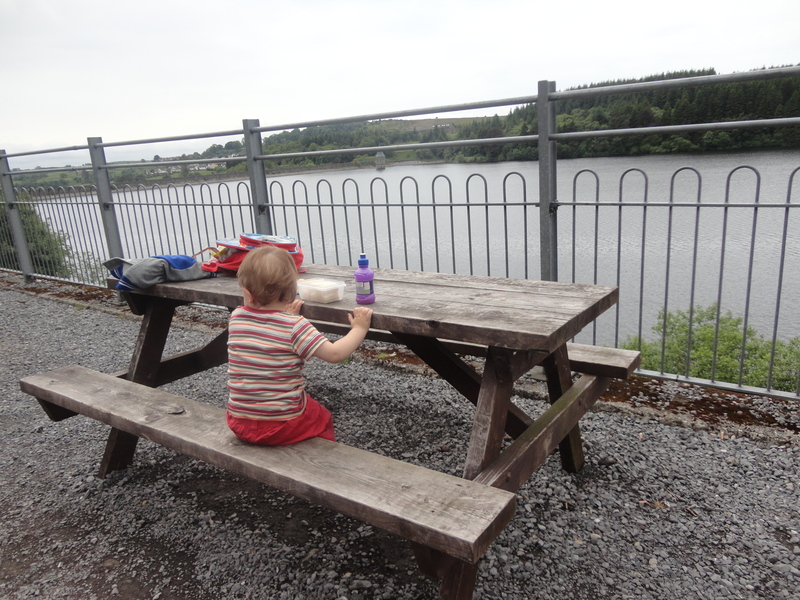 The journey now continued along the banks of the Taf Fechan Reservoir. 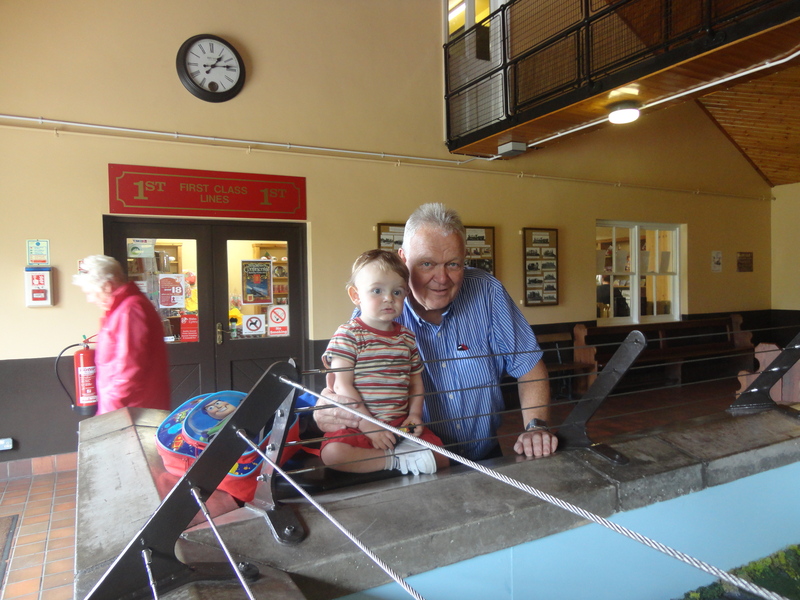 On the left we saw the Merthyr Tydfil Sailing Club (Yes such a place does exist!) with its adjacent boat-park and at this point a deviation to the original railway alignment has been constructed to avoid the car park. 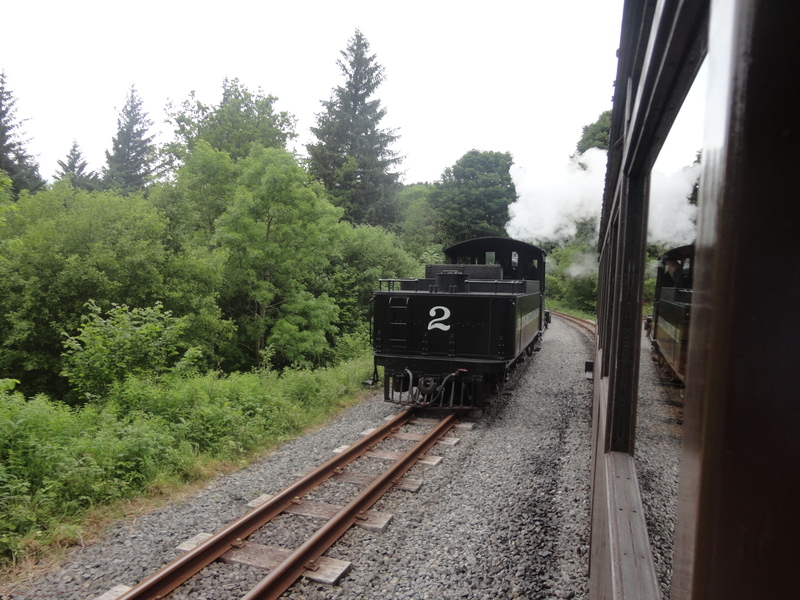 We journeyed on past Pontsticill station before reaching the terminus. 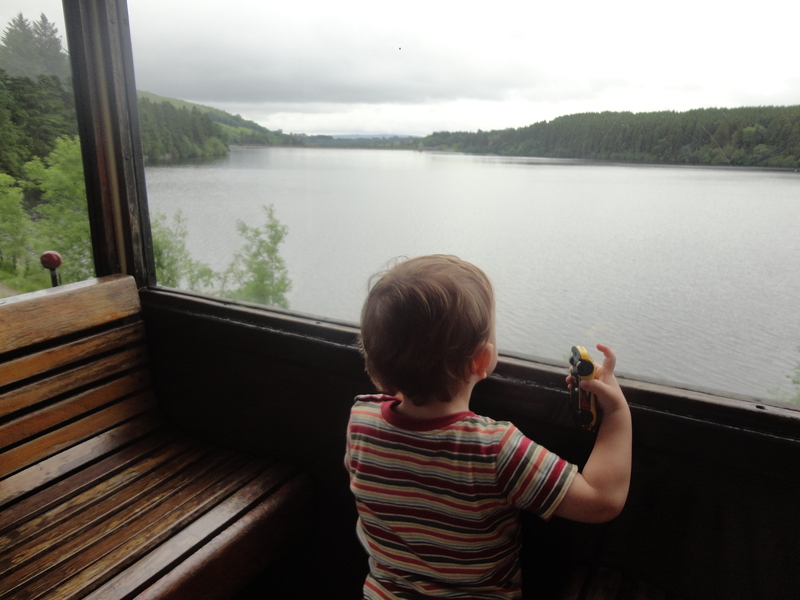 The journey ends at the Northern end of the Reservoir and the locomotive runs round to the opposite end of the train for the return journey. 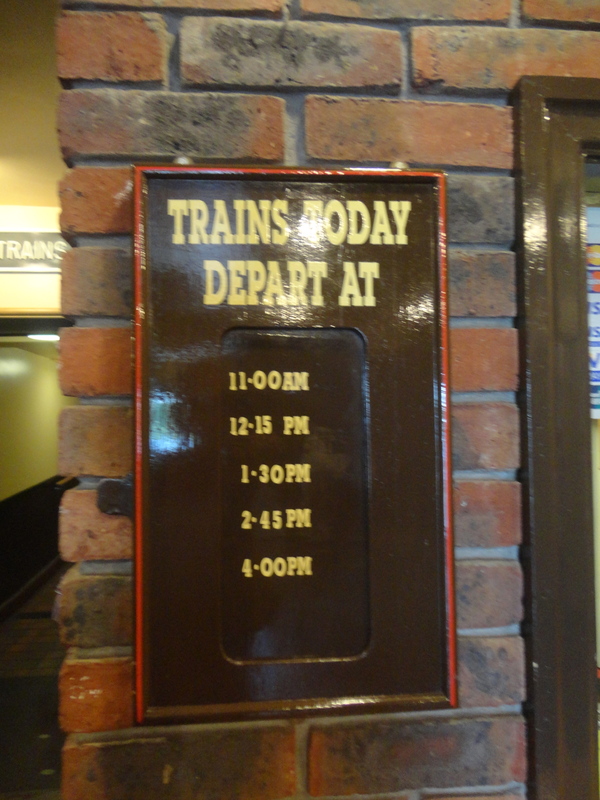 It is not possible for passengers to alight at this temporary terminus. 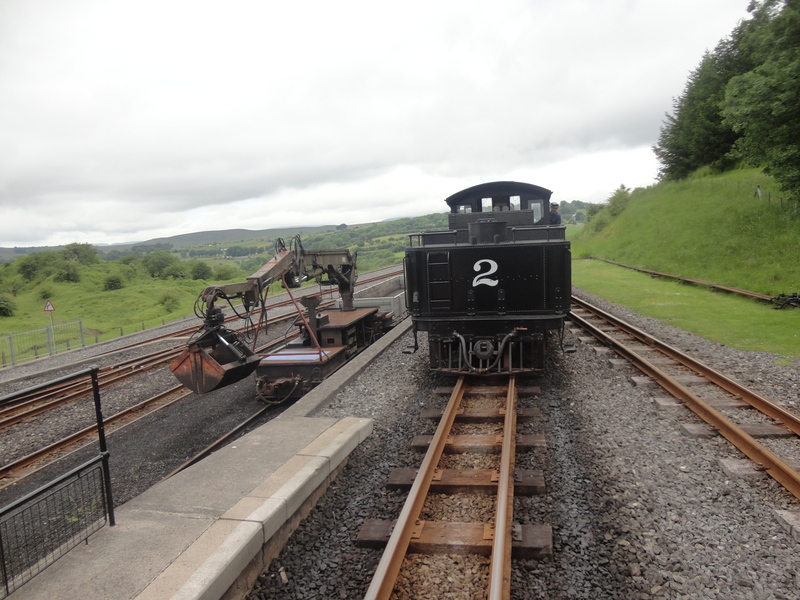 We could see that the track continues and next year the train will continue a further 1 1/2 miles to Torpantau, high in the Brecon Beacons. 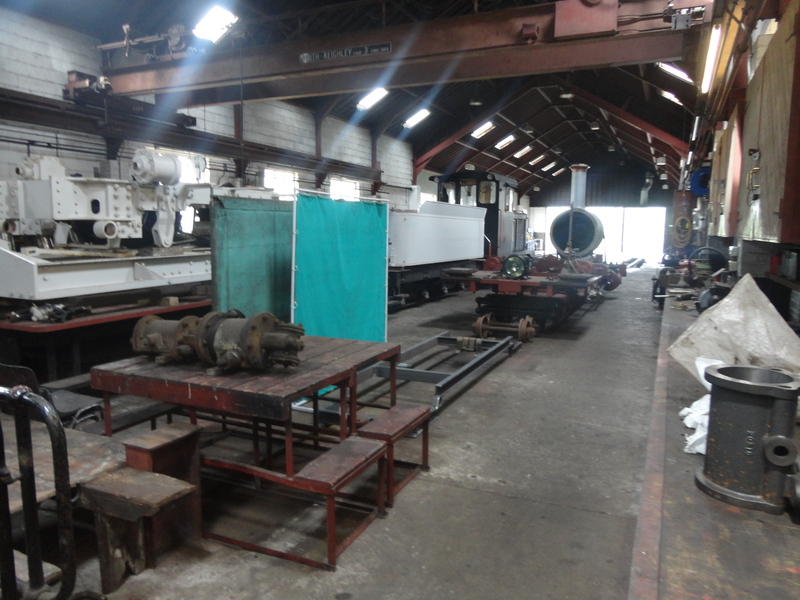 The company is, at present, constructing additional locomotives to cope with the severe gradients on this new section. 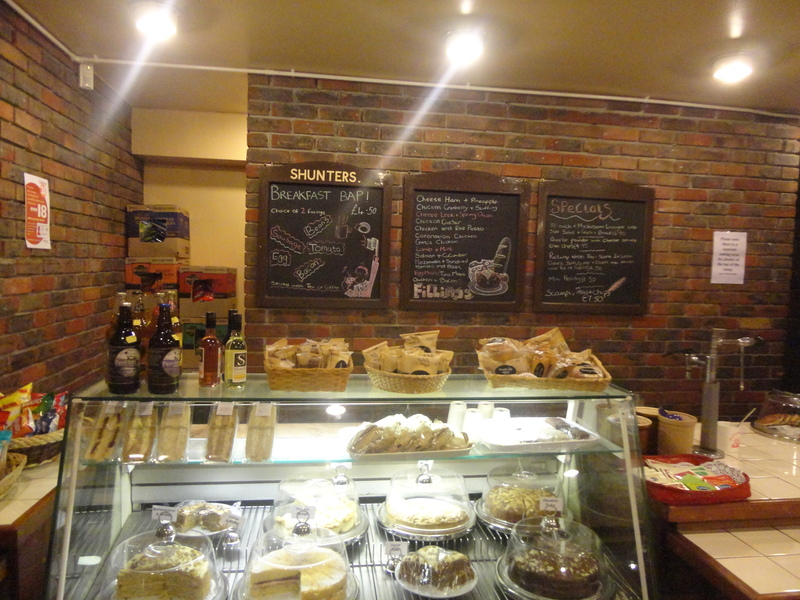 When they open this new section, we will return. 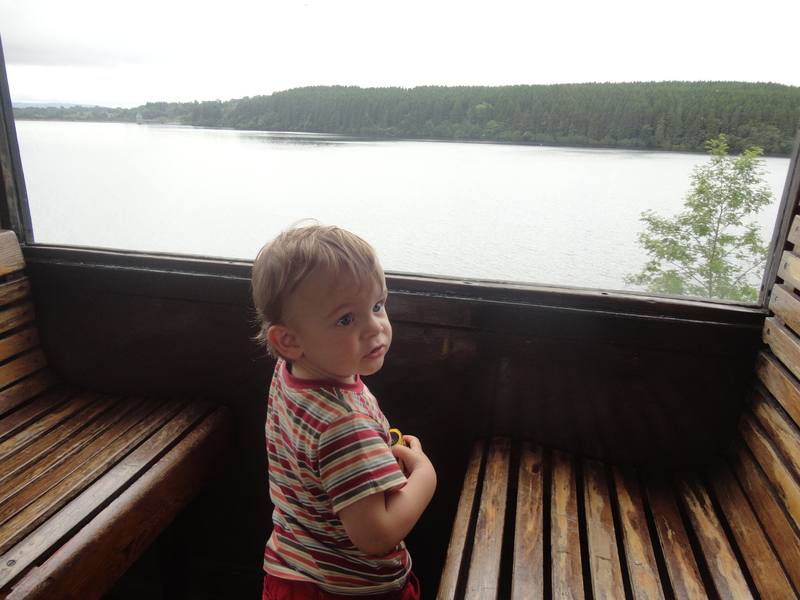 On the return the train stops at Pontsticill Station for twenty minutes, enough time for a picnic overlooking the reservoir and buy a cup of tea from the café built from some old railway wagons. 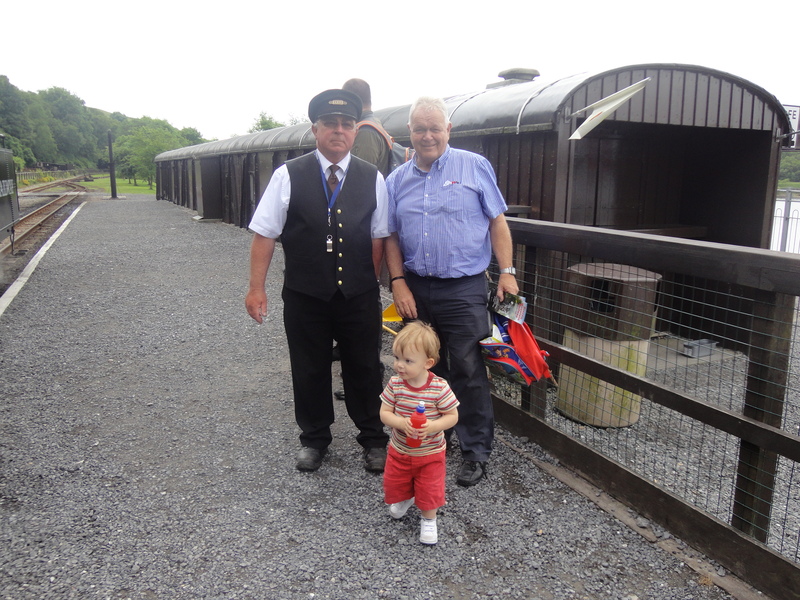 Alfie had his picture taken with the guard. I so wanted to try on his hat but lost my nerve at the wrong time. 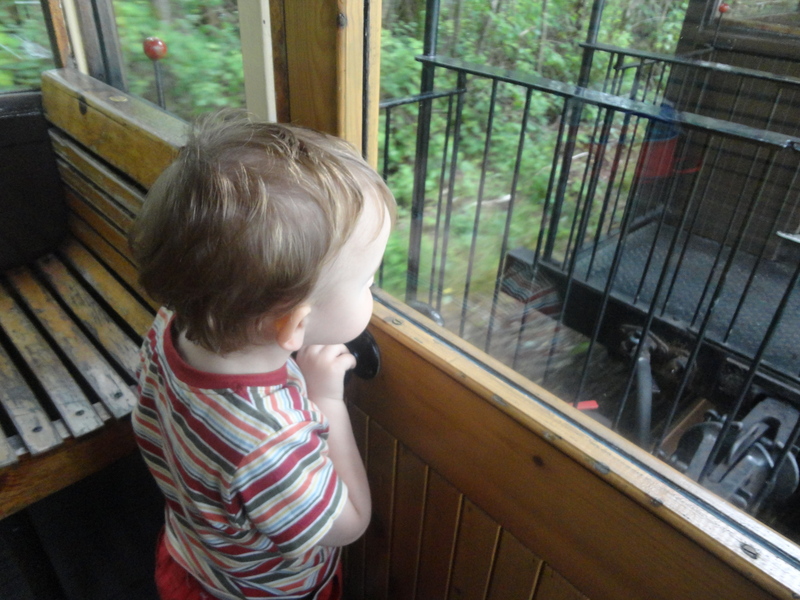 We boarded the train and travelled the rest of the way back to Pant quietly reflecting on this marvellous little railway. 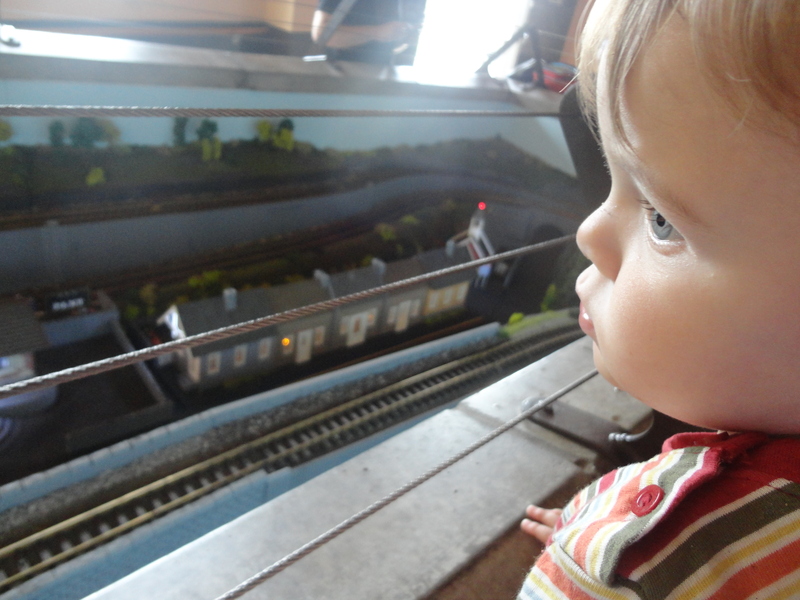 Pant Station meant only one thing for Alfie, another chance to look at the model railway. We spent ages there. 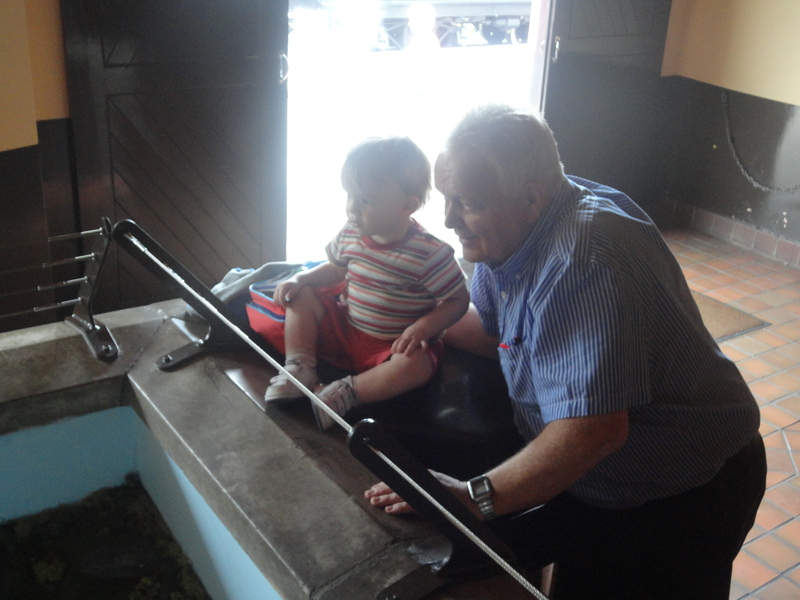 He was well and truly transfixed. The journey back to Cardiff was a long but happy one. Alfie didn’t or couldn’t sleep all the way back. I reflected on the fact that in September, Alfie’s Adventures will change and become Alfie’s and Millie’s Adventures. His mum is changing her days in work and Alfie will visit us on a Tuesday, a day when he lady of the house is off work. I will miss these special days but hope including the lady of the house and Millie in our days will make them even more special. 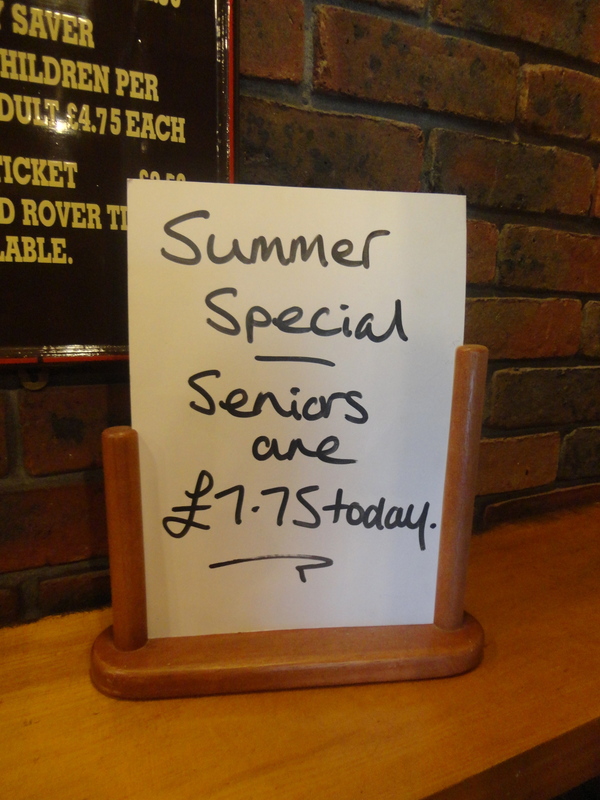 Trouble is the dear lady is not a pensioner so things might become a little more expensive. I think my little buddy and I need to start planning now. This has been a wonderful week. 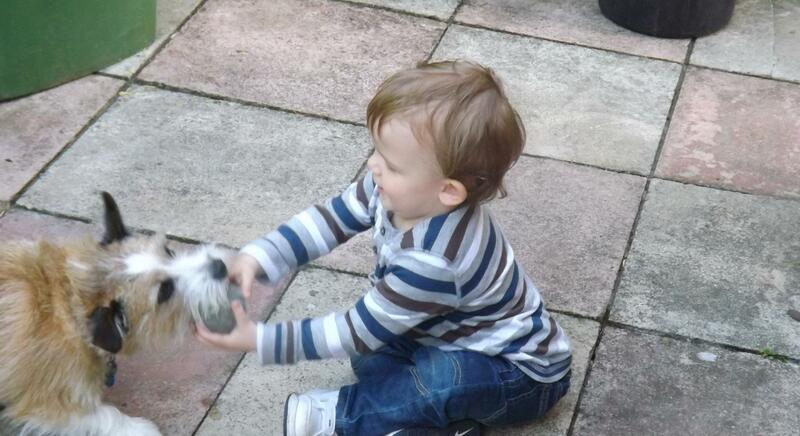 Alfie has been staying with us for a few extra days as his mum had been called to work. 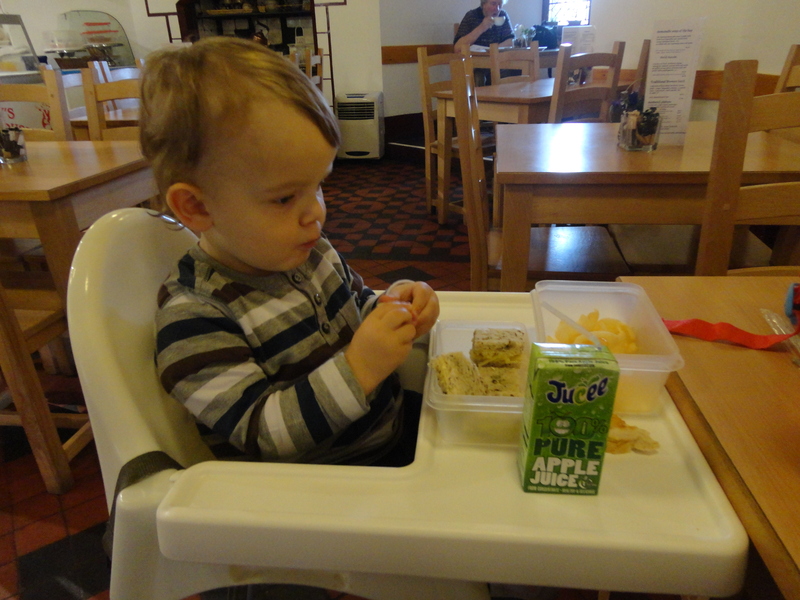 On Monday Alfie had travelled to Bath with us and enjoyed breakfast in the Pump Rooms and a wonderful day looking at the sights of that great city. We went to Bath at the request of Richard and Kim, two friends of ours from Northern Ireland and the U.S.A. who were staying at our place. On Tuesday Alfie and I had taken our two friends on a mini tour of the area, showing them Hebron Hall, Cosmeston Lakes, Penarth town centre and seafront – I am still mystified at what is going on there, the pier will look great when it is done but that building site where Rabaiotti’s used to be is a disgrace and an embarrassment. 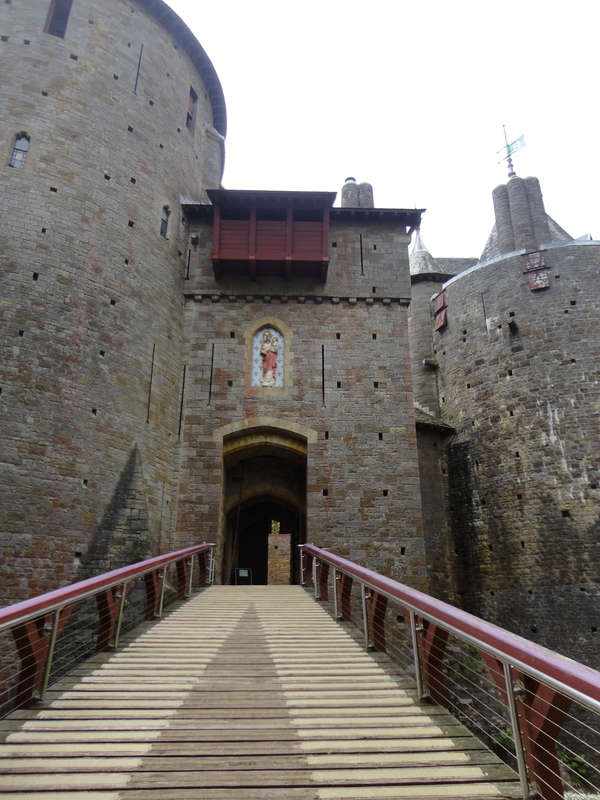 Richard and Kim also wanted to see St Fagan’s and ‘The Fairy Castle’ otherwise known as Castell Coch. 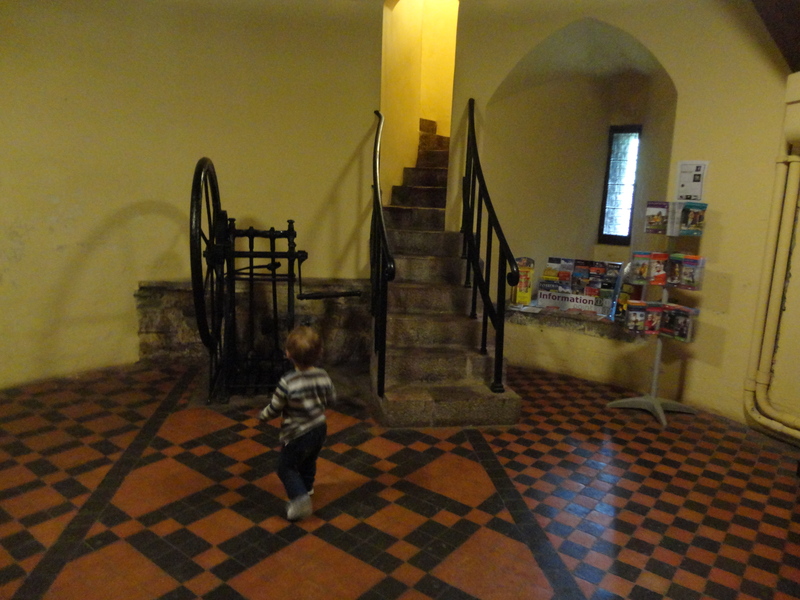 When Richard stayed with us we gave him a book all about Cardiff and Castell Coch had stood out for him as a place to visit. We were happy to take them. 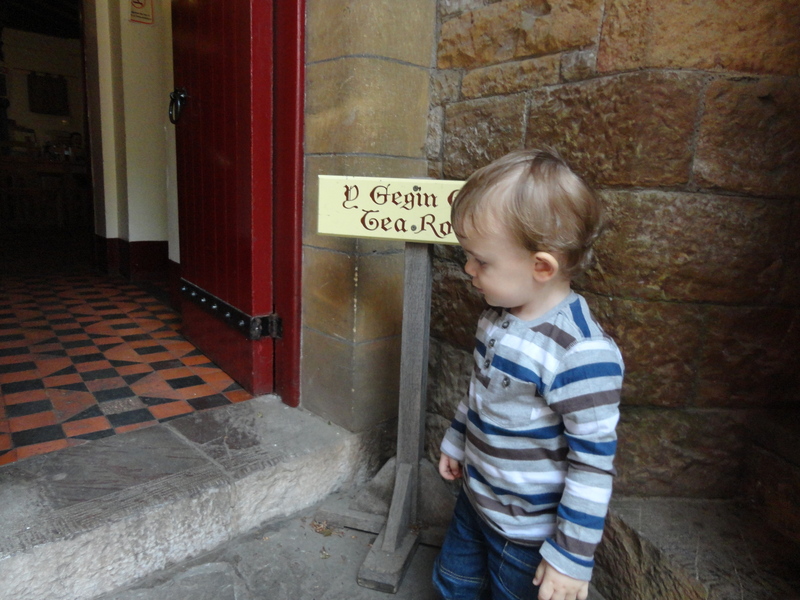 After Penarth we headed for Tongwynlais. 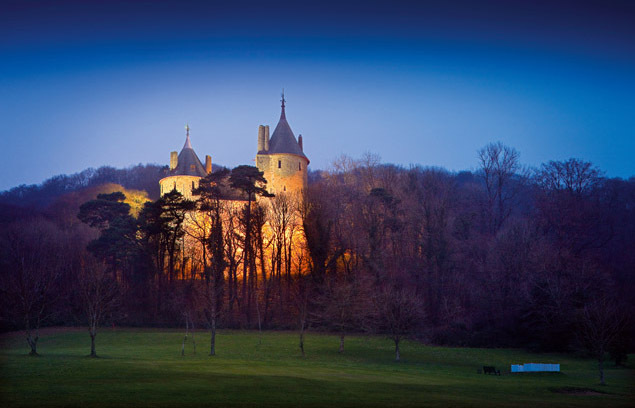 Castell Coch was the beautiful fabled home of a very wealthy man. While resting on ancient foundations, Castell Coch, which means Red Castle in English is relatively modern, the by-product of a vivid Victorian imagination, assisted by untold wealth. 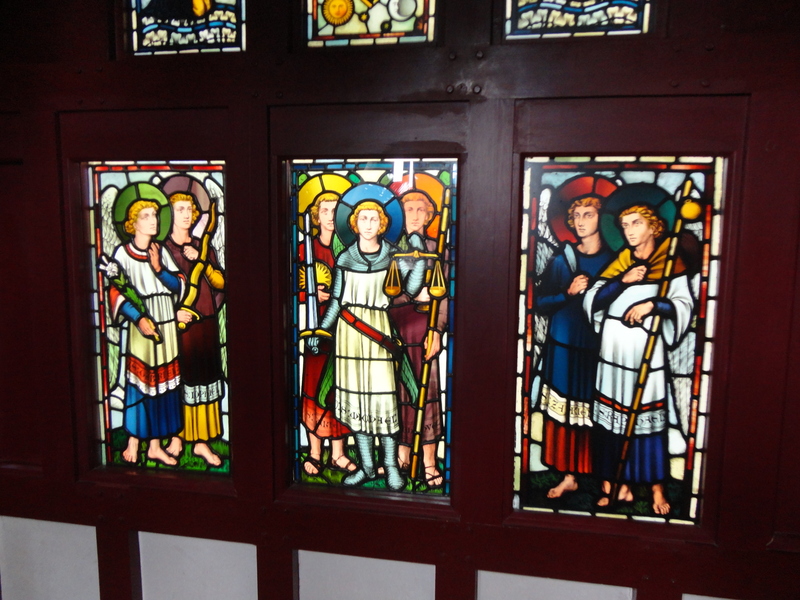 The Middle Ages fascinated the Victorians as much as the Victorians fascinate us today. High Gothic was the order of the day. 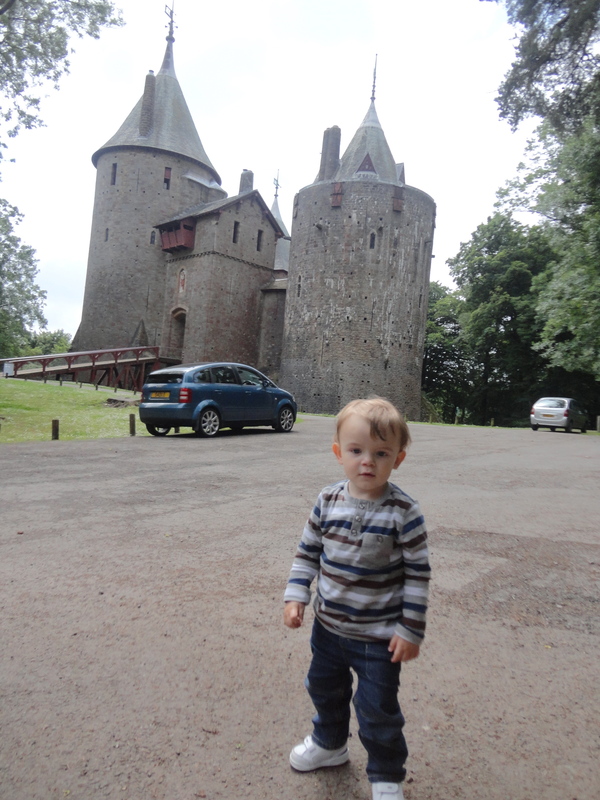 When Alfie and I took Richard and Kim to Castell Coch it marked the end of probably a thirty-year gap since I had been before – what a waste, I had taken the place for granted all these years and I never realised before what a treasure it is. When we visited on Tuesday Alfie had been asleep so we had not gone in, but our friends had spent a couple of hours inside. 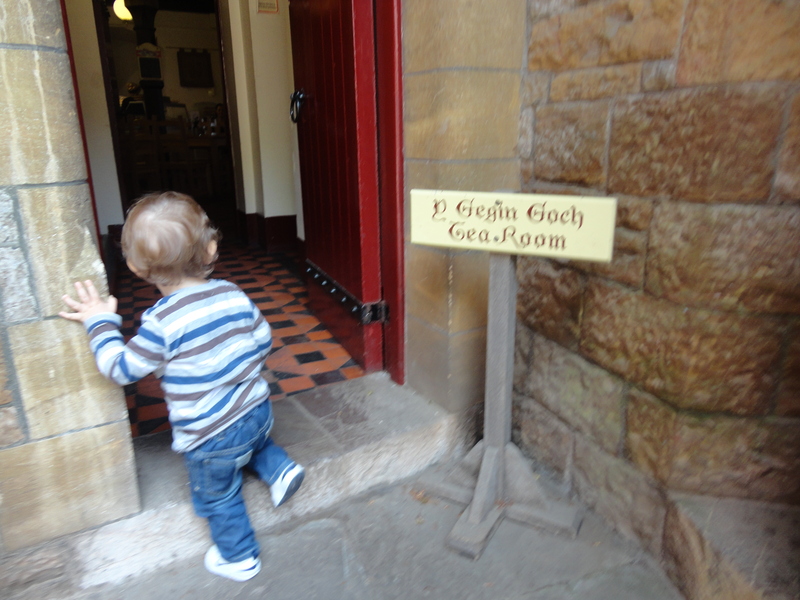 So we decided having not visited for over thirty years, we would make two visits in a week. It would be fun! Alfie stayed overnight and the lady of the house had him bathed and dressed when I got up. He looked great. After breakfast, we took the lady of the house to work and then prepared for today’s adventure. On arrival home I had the usual ritual of unclipping Alfie’s harness in the car seat and then letting him play with it for five minutes. 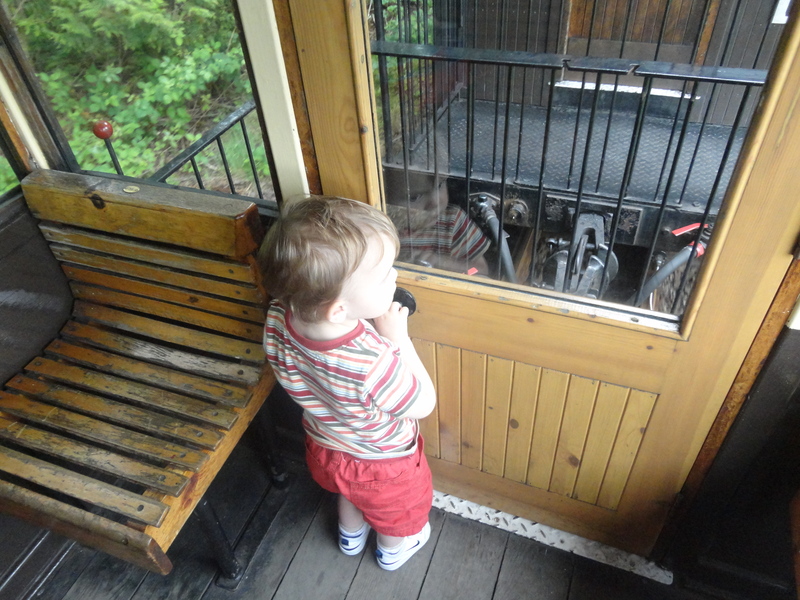 He is fascinated by straps and buckles. I sat and listened to Chris Evans. 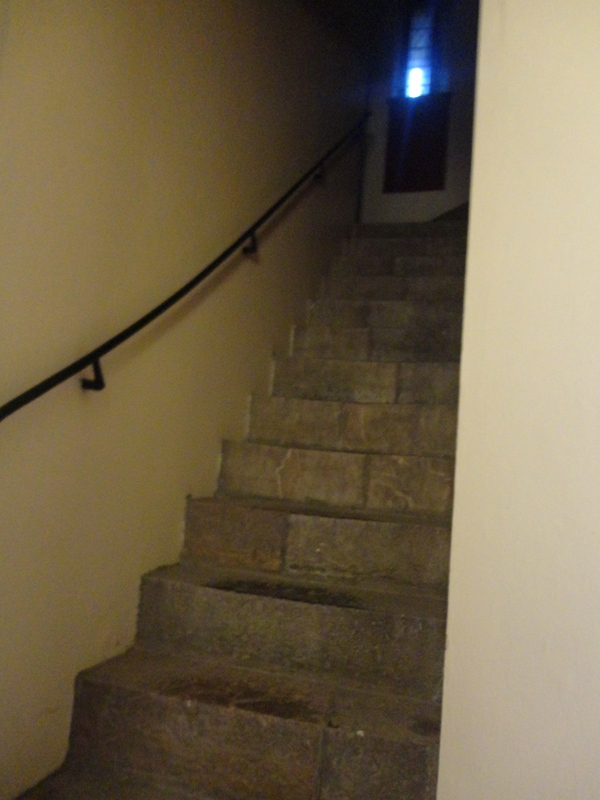 We went inside. 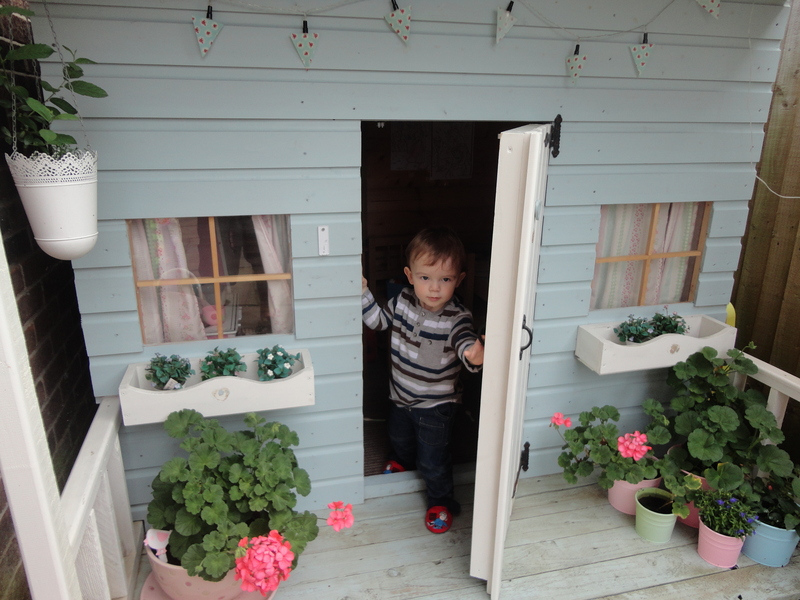 Back in the house, as I was tidying up, Alfie noticed the back door open and made a bolt for it. In doing so he caught his foot on the dog basket and tripped and fell into the open door. He caught his head on the door and was sporting an egg shaped lump, almost as big as the free range ones I get from Janice and Tony for the rest of the day. 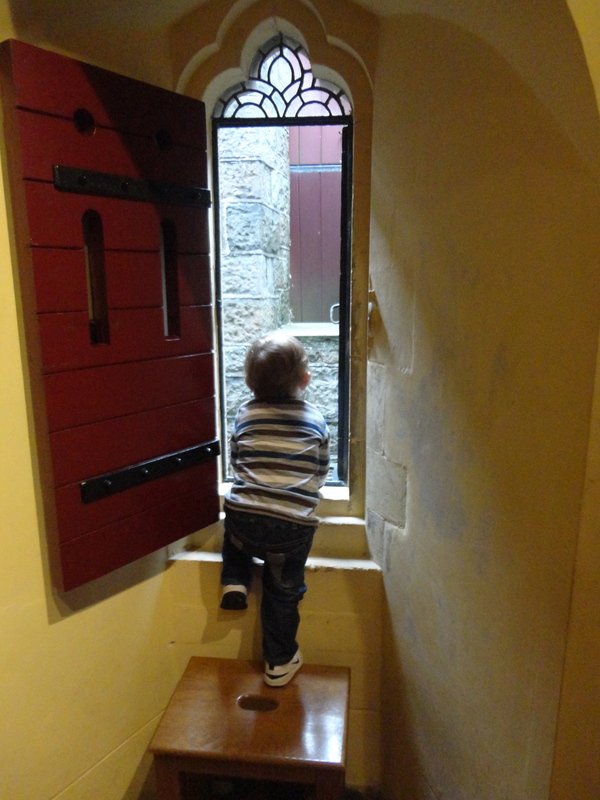 I am still puzzled why Alfie was making a bolt for the door, as the current locking system is quite adequate. 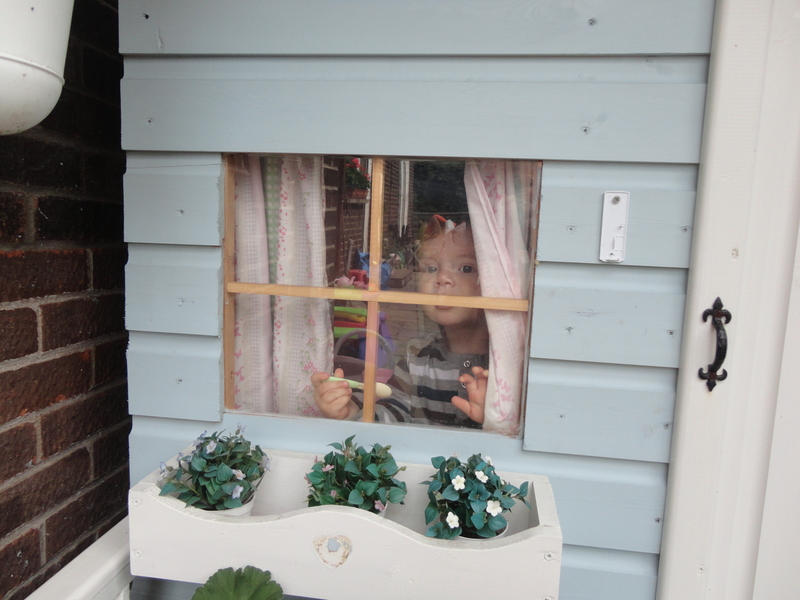 After this we fed the fish, played in the garden and Alfie had great fun in the playhouse. 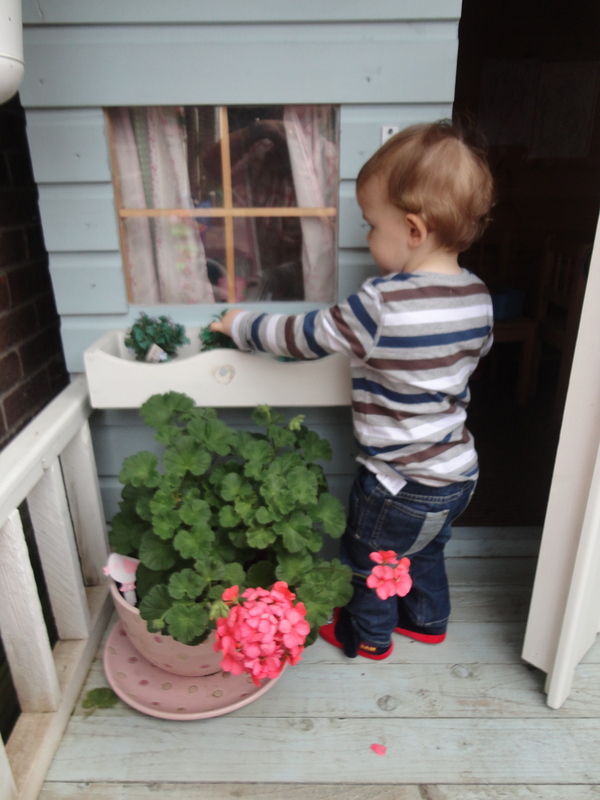 After Aunt Bes got home and I helped her with some business, Alfie and I set out. 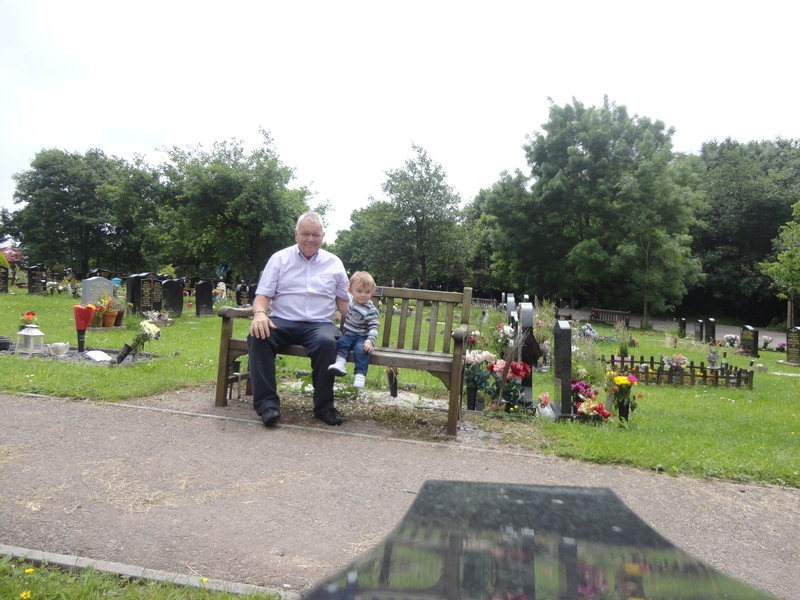 We travelled first to Thornhill Cemetery. 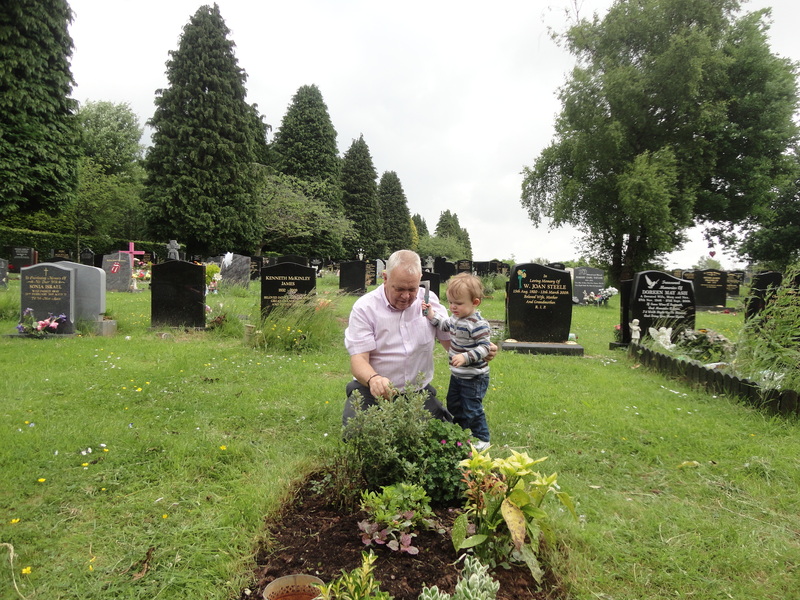 On fathers’ day I noticed that my parents’ grave needed a Spring clean, so I had promised myself that as soon as I could, I would take my garden tools and spruce it up a bit. When we arrived Alfie had dozed off so I began work alone. 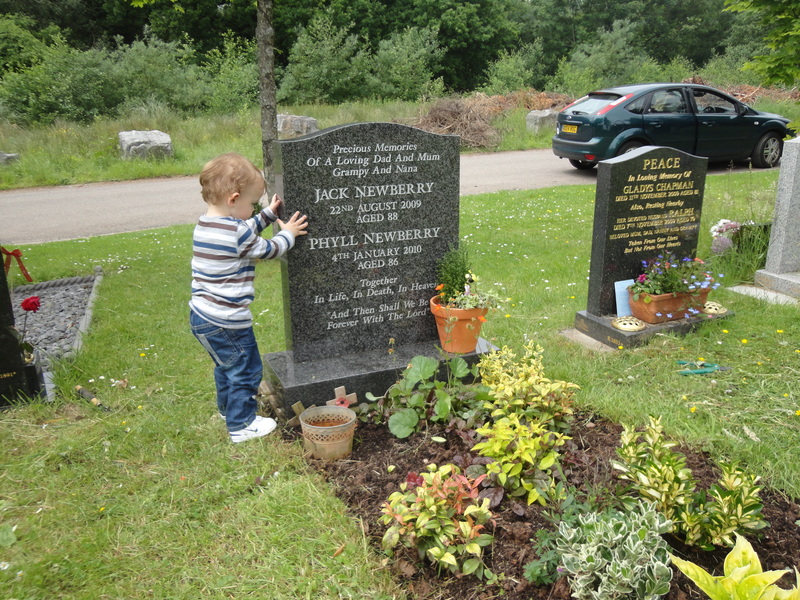 It was a peaceful morning and in a strange way, dad and mum felt very close. They are not there I know, they are at home in heaven, but being there in the quietness and reading the words of Elizabeth Barret Browning’s poem “How do I love thee’, which is engraved on their headstone, caused me again to thank God for two such absolutely wonderful people I was able to call my parents. We are currently going through 1 Corinthians Chapter 13 in church, that great biblical piece on love and each week I think of them. We have learnt that… Love is patient, Love is kind, Love does not boast… and it reminds me of the house of love where I grew up and all those characteristics of love were regularly shown. 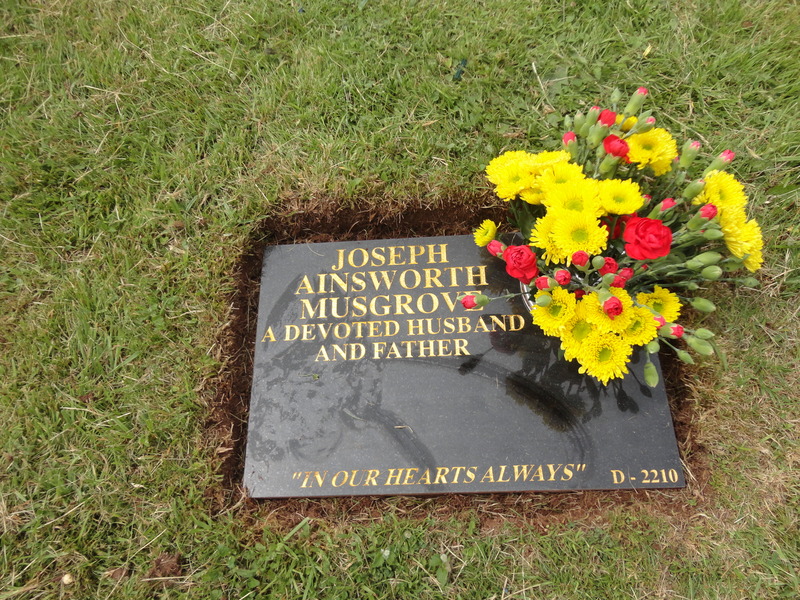 My dad and mum both lived a life of love and I am committed to carrying that on with my own family. I smiled, wiped a single tear away from my cheek and got on with the job. 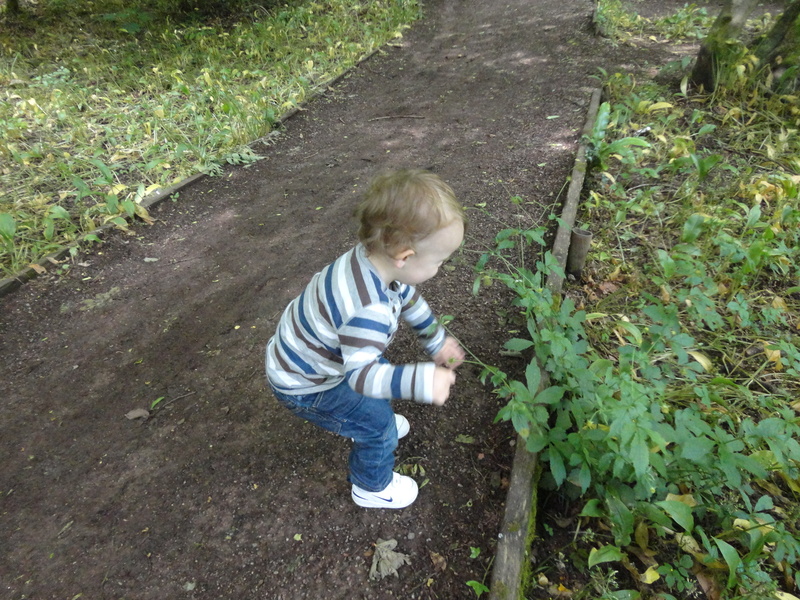 I loved that time pulling up the weeds and grass – I felt like I was doing it for them. I wasn’t long into it when I heard the little fella, talking in the car. 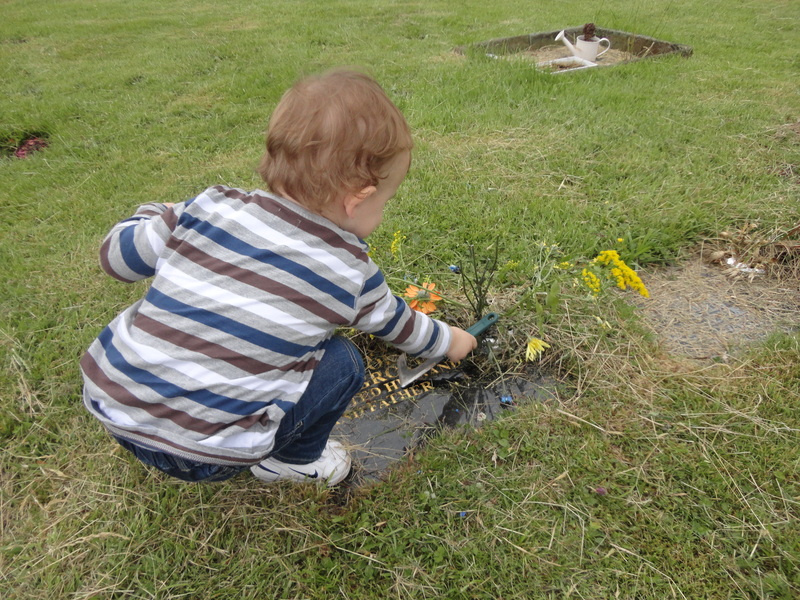 I got him out and he joined me kneeling by the graveside. He’s not into gardening much, so he was soon off exploring the other graves. 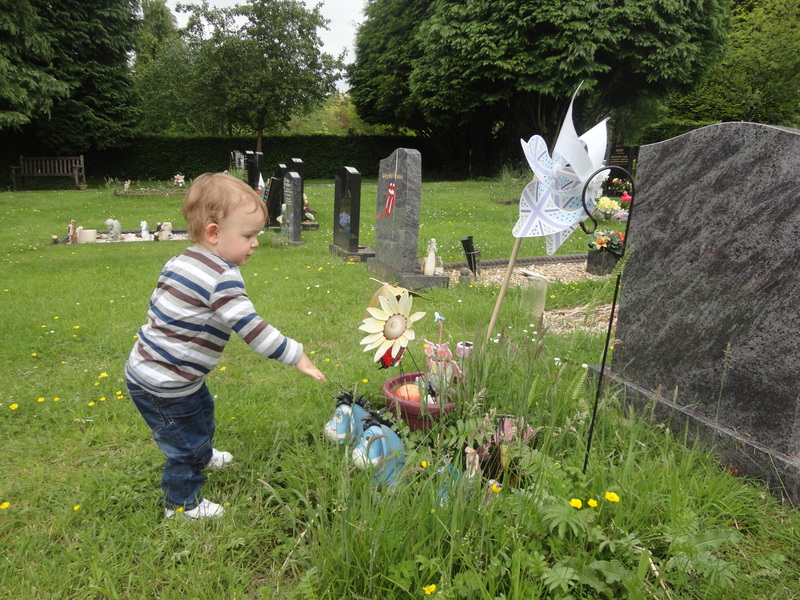 He did find some of the other ones much more interesting than my dad and mum’s and played with the windmills and little ornaments that people had left on the graves. He was always totally respectful and just touched them and flicked the windmills to make them turn. 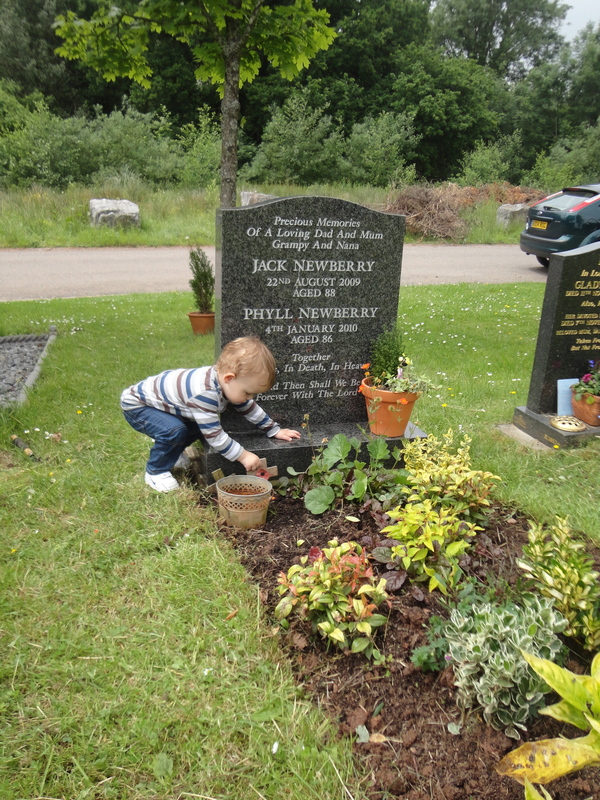 I feel certain that the owners of the grave would only smile if they knew a cute little lad was fascinated by things put down to treasure their memories. There were many sad stories behind some of those graves, so many young people. 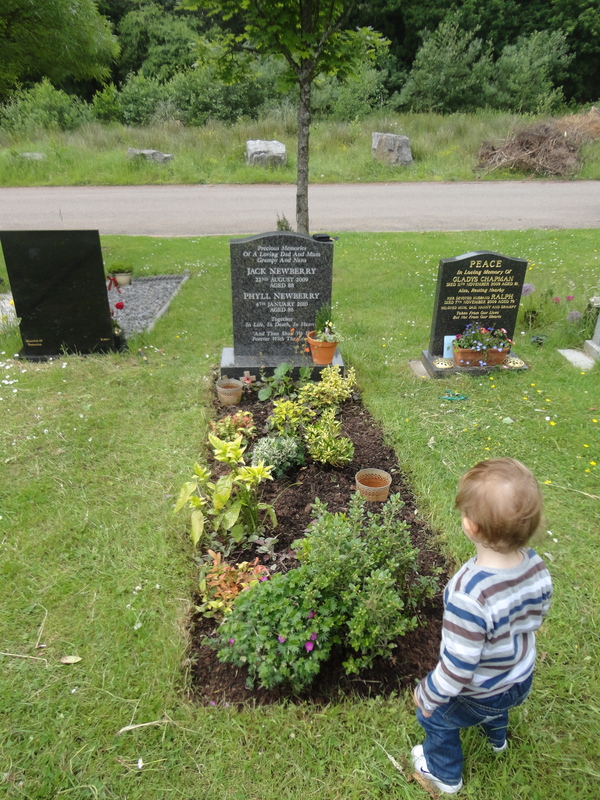 I got chatting to a couple of ladies who were tending the grave of a husband and dad. They had a car with a complete flower arranging set up in the back and the results were fantastic. 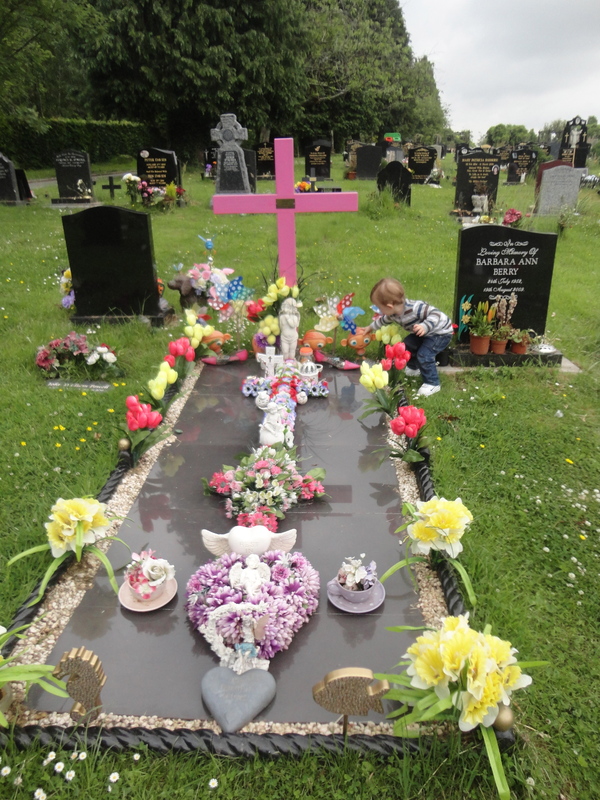 I complemented them and thought of my mum’s old shop ‘Flower Trend”… happy days!! 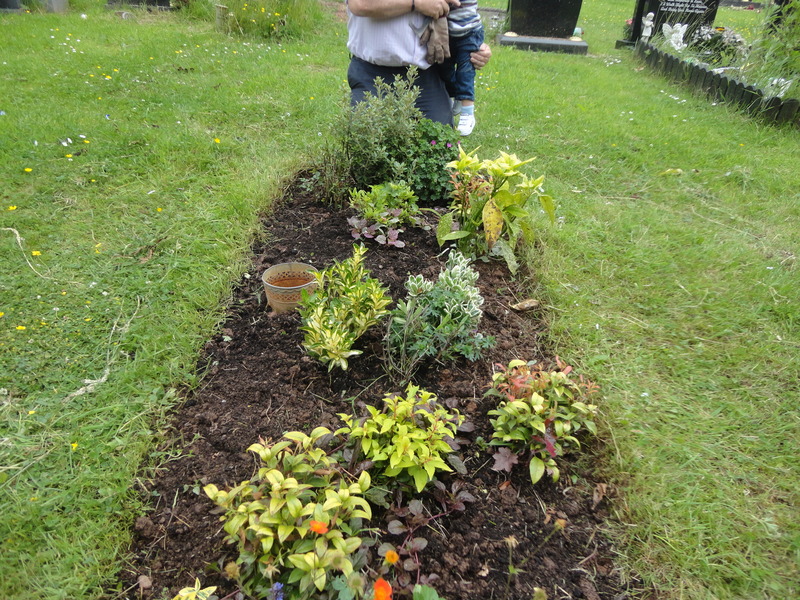 We then moved on to tidy up the lady of the house’s dad’s grave, although as he was cremated he has a plaque with his name on. 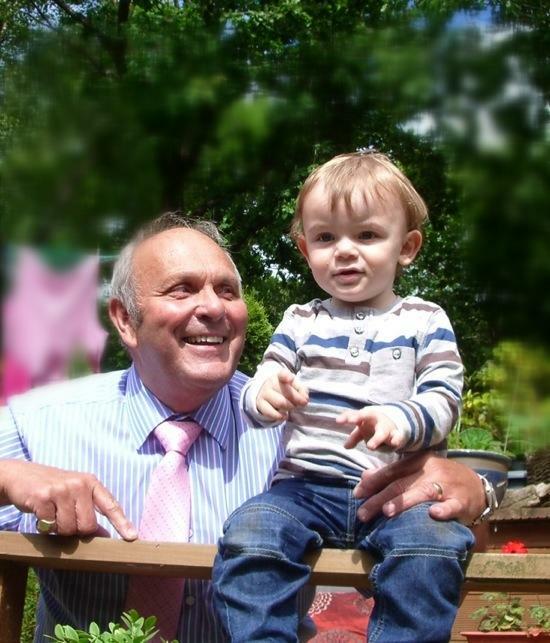 He was a wonderfully kind and gentle man who was loved by all who knew him. I had the privilege of knowing him for only ten months but during that time I came to know and love him. He did a wonderful job of raising his children, but sadly he was taken from us too soon! 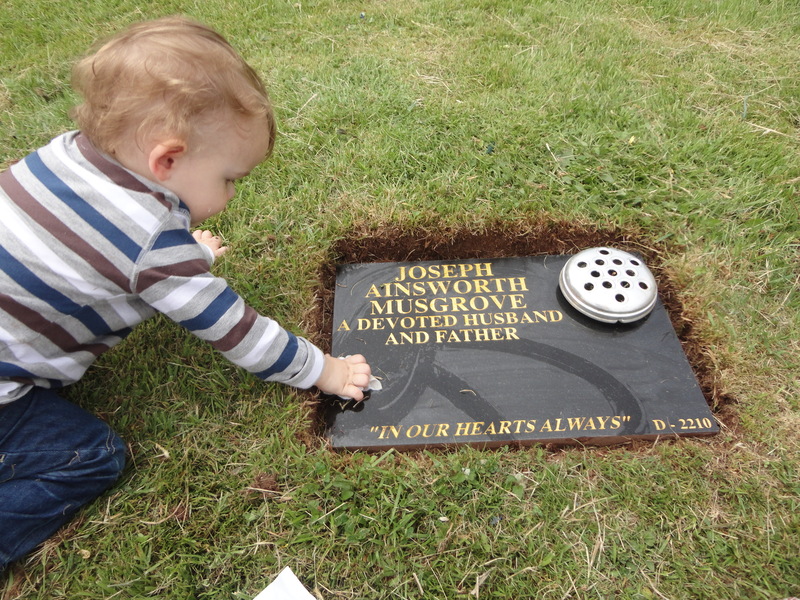 Alfie was great here and helped me in cleaning the stone to bring it up to a standard, which honoured the great man. 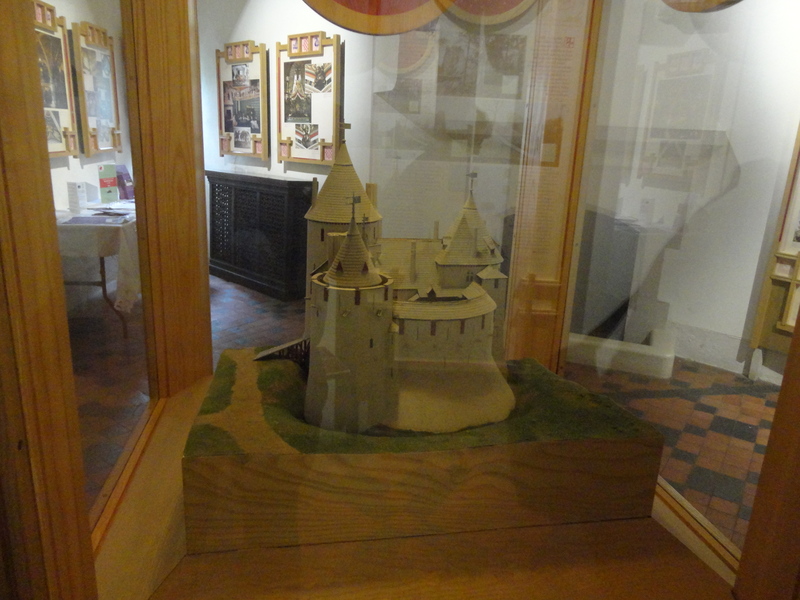 From here we moved on to Castell Coch for our visit. 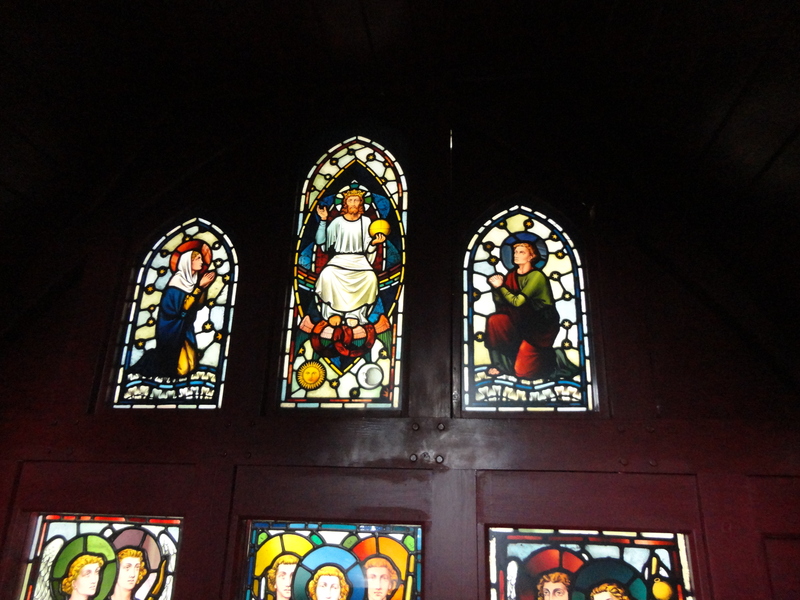 We drove up through the small village of Tongwynlais. Tongwynlais is a small community village in the north of Cardiff. It is a quiet, friendly place with a population of around 2000. 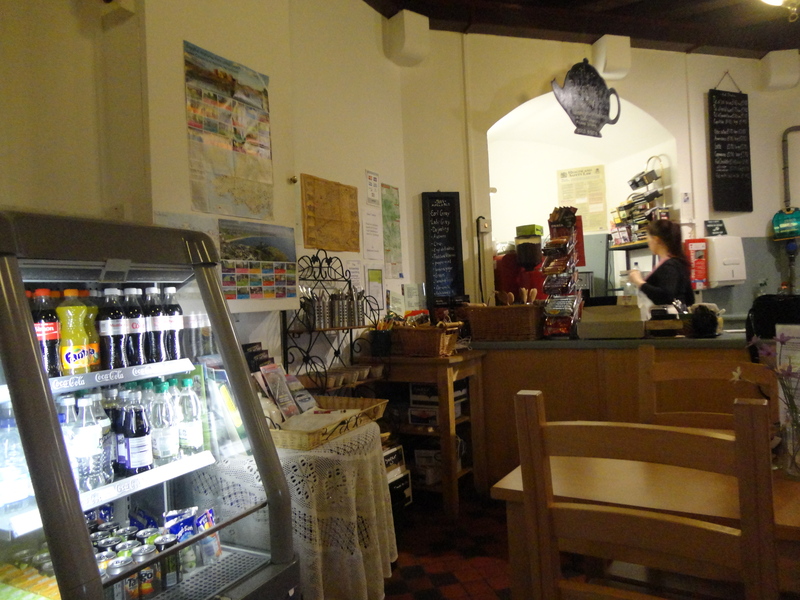 The village is very popular with cyclists as the Taff trail passes through. If my Welsh lessons served me well Tongwynlais means ‘Sound of a white voice’. 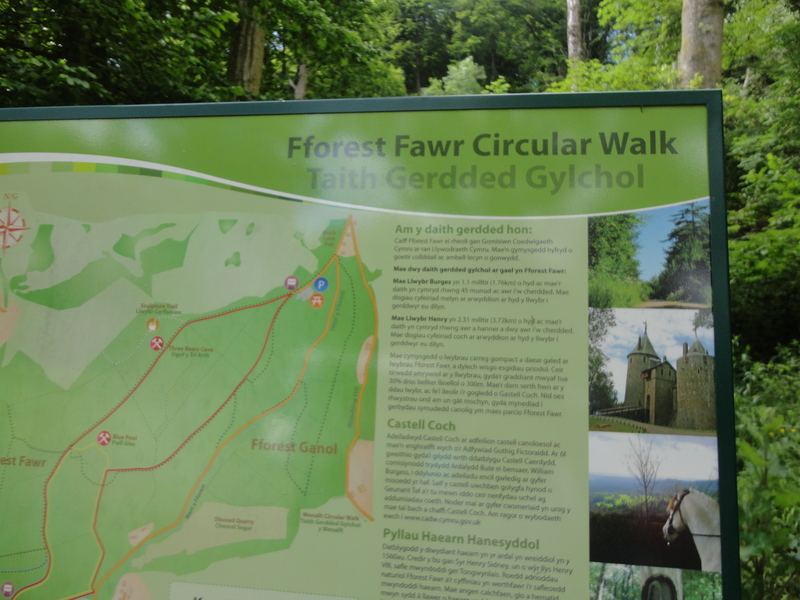 To the east of the village is Fforest Fawr, a beautiful Forest leading to Caerphilly Mountain. 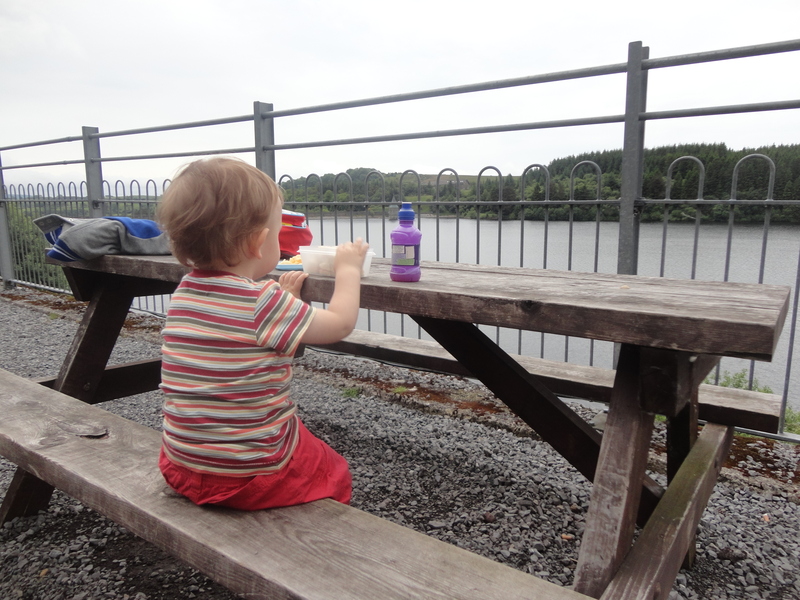 To the West you will find the river Taff, Forest Farm Country Park and the Glamorganshire Canal. I have always thought of Tongwynlais as being a bit rough but I am totally wrong, it’s a pretty little village and a lively community. During the summer months Tongwynlais has a beautiful display of hanging baskets, created by Tongwynlais Community Primary School and funded by Tongwynlais Community Council with help from local businesses who kindly contribute towards these and the Christmas lights in December. 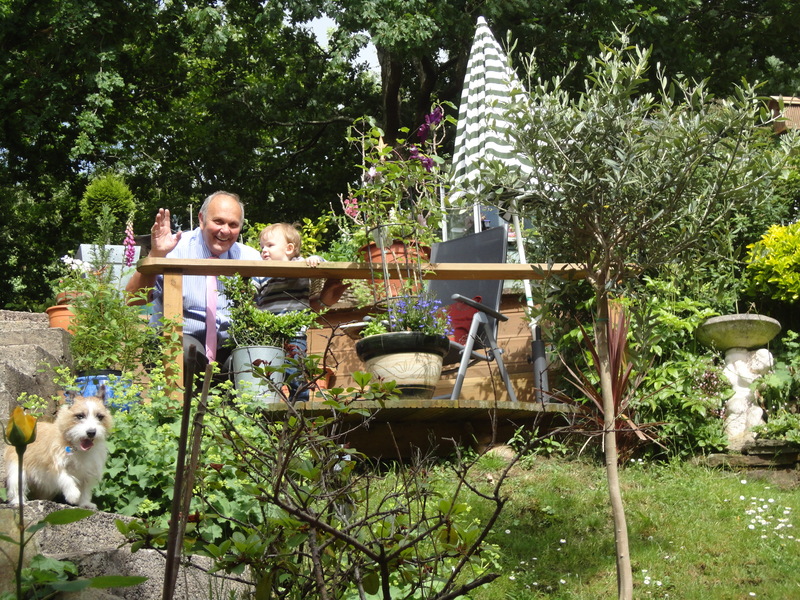 Each year the village is entered into the Cardiff In Bloom, Best Commercial Street competition. We parked and made our way to the castle. 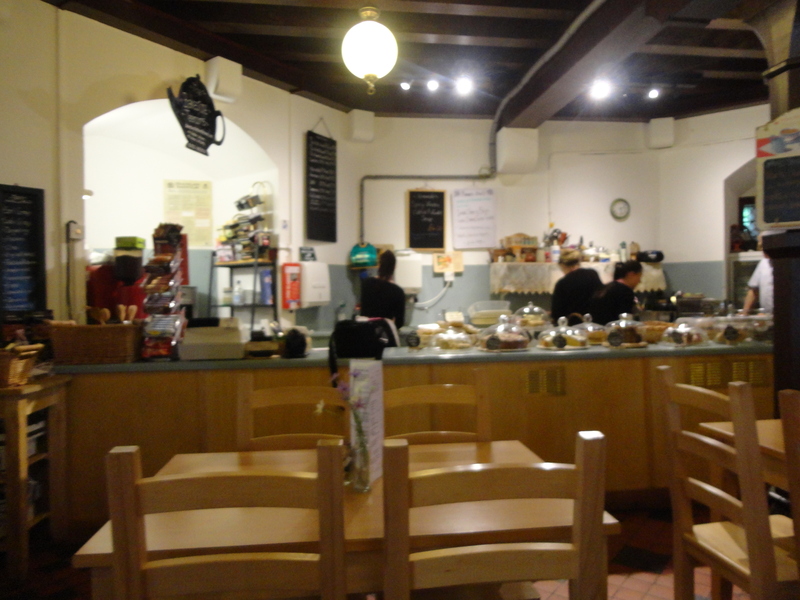 I paid my entry fee (Seniors of course) and Alfie and I decided we would start our exploring in the teashop, as we were both hungry and thirsty. 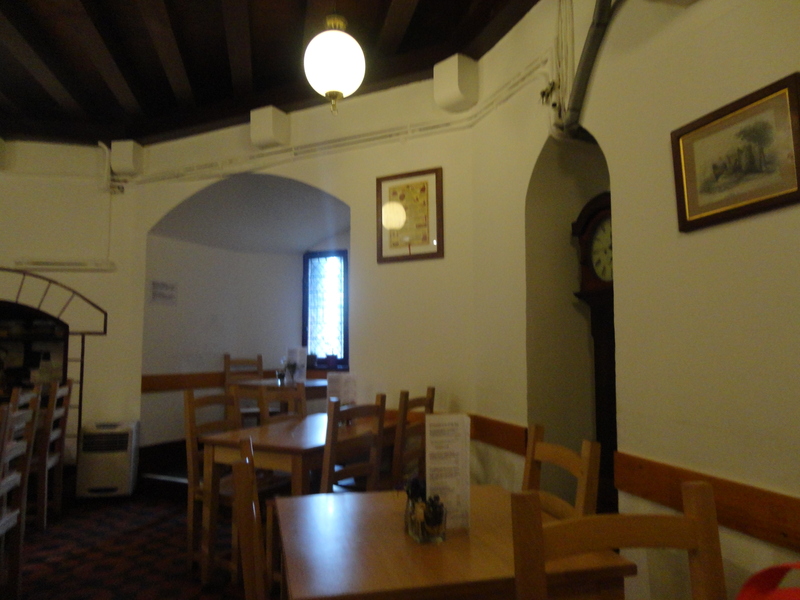 We enjoyed a leisurely lunch together before starting to explore the castle, which was full of winding staircases and grand rooms. 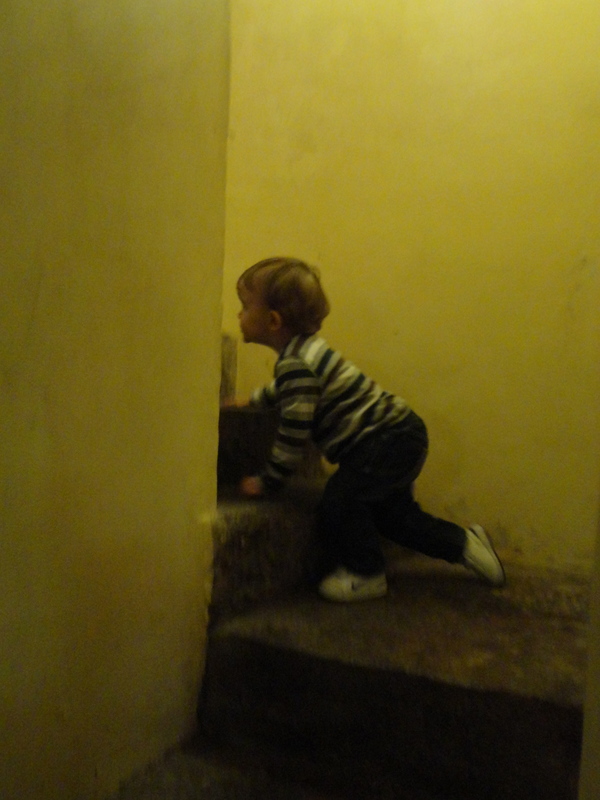 Alfie loved climbing the stairs the best even thought they were steep, high and hard. 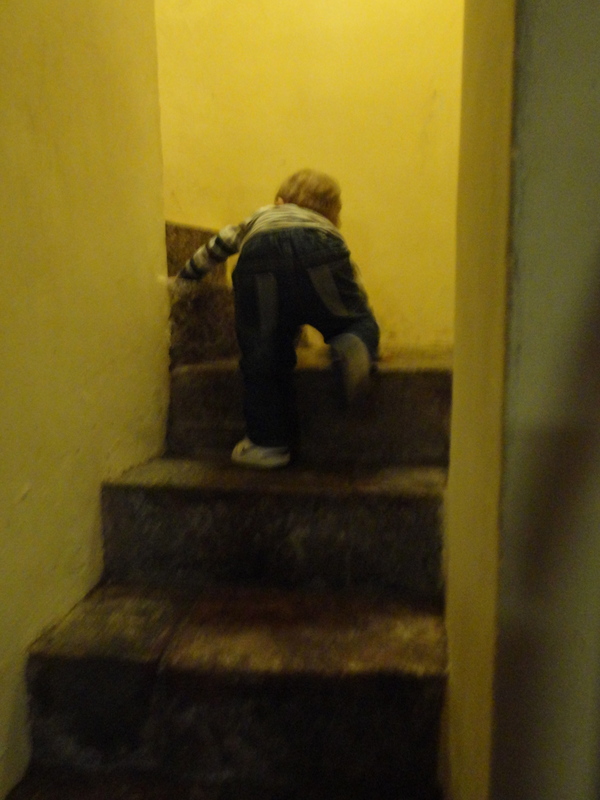 Alfie is becoming a seasoned explorer and nothing was too hard for him to attempt. 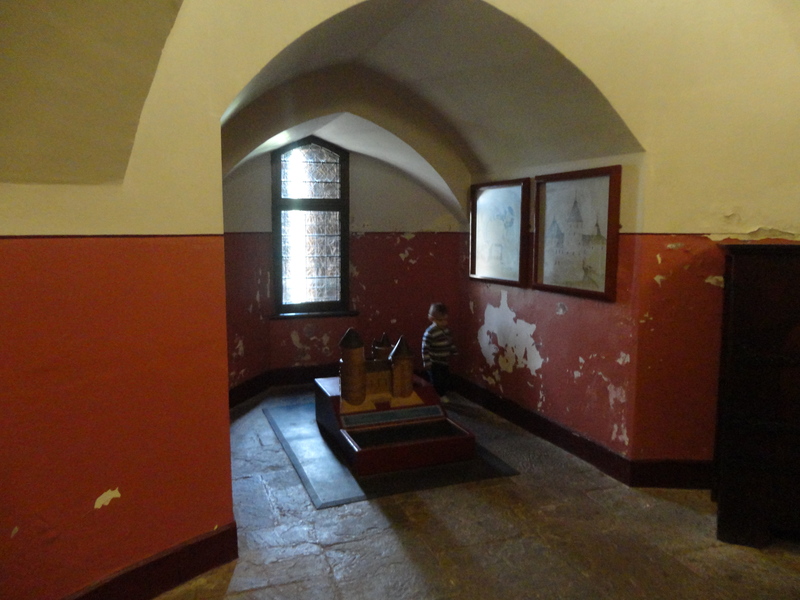 We loved looking at the grand rooms including a little chapel in one of the rooms in the top of one of the towers. 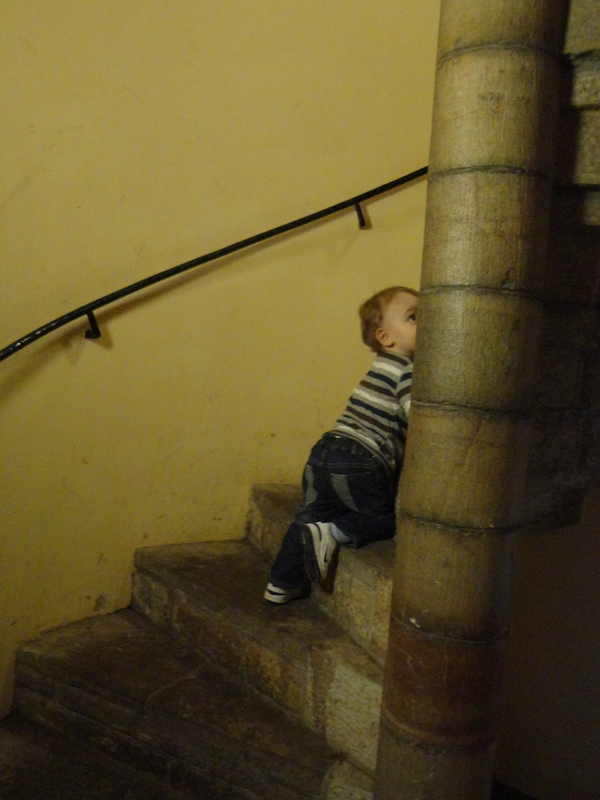 Climbing downstairs was too much of a challenge for my young companion explorer and he ended to be carried in a safe pair of loving arms. Having a look around the gift shop was, on reflection, not the best idea as Alfie decided to touch and grab almost every item on sale. We didn’t stay long in the gift shop. 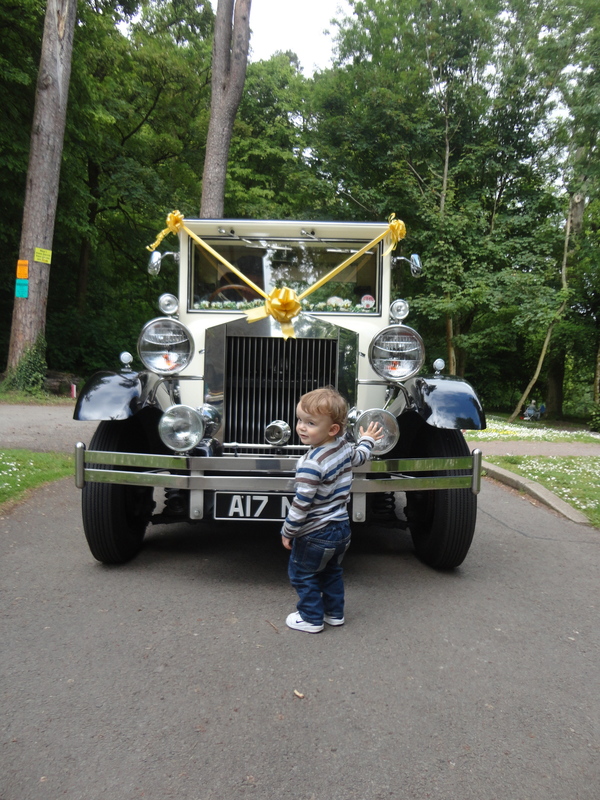 As we left the castle, a wedding appeared and Alfie went off to explore the wedding car, a beautiful Rolls Royce. 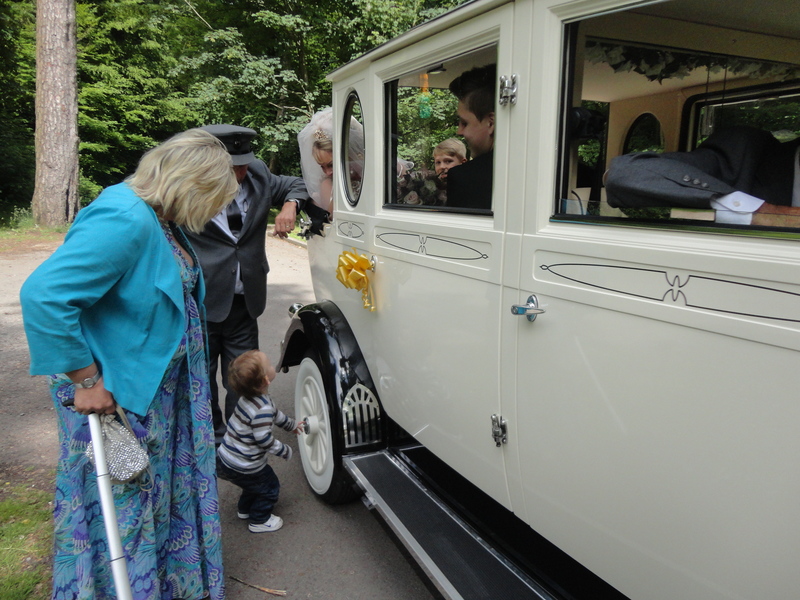 He started by checking the wheel nuts, much to the amusement of the bride and the chauffeur. 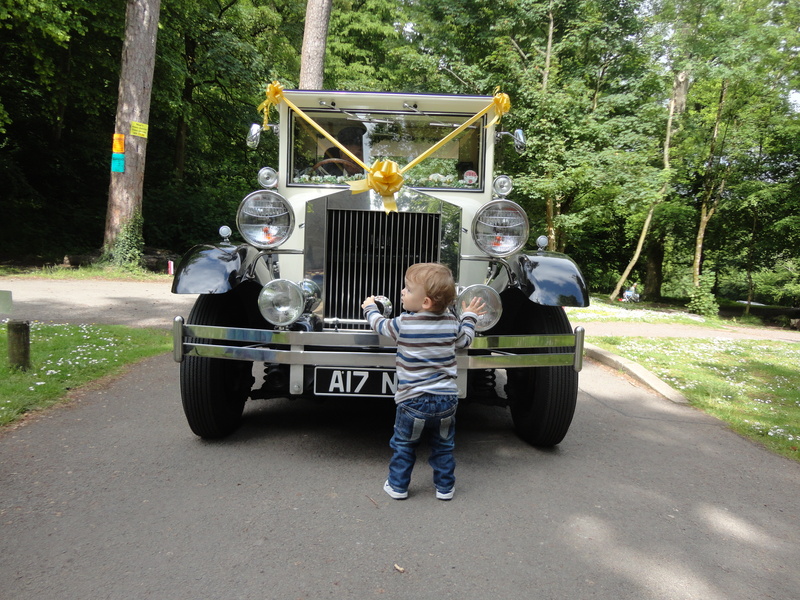 He then chatted at length with the wedding party… I am sure that little lad could charm his way into any and every situation. I am certain they were thinking about adding him to the guest list! 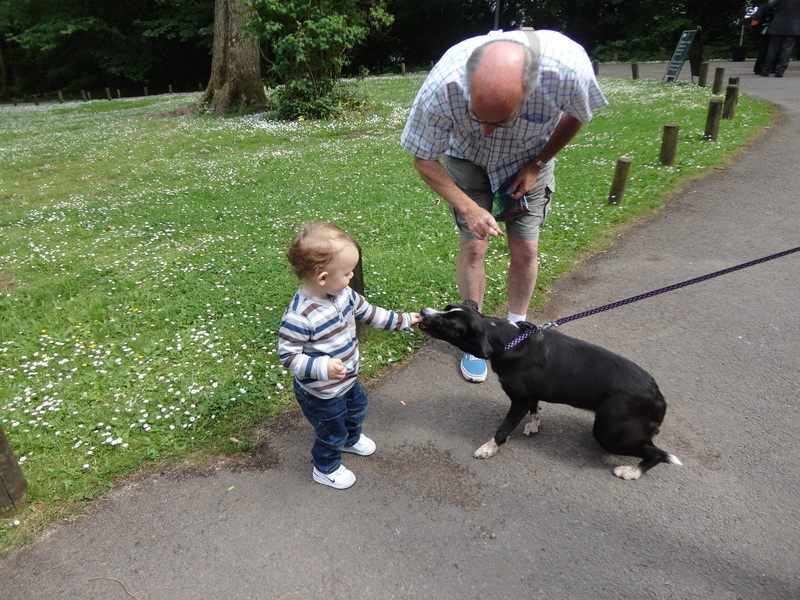 As we made our way out to explore the grounds we met a man with a dog, who began showing off his training skills. 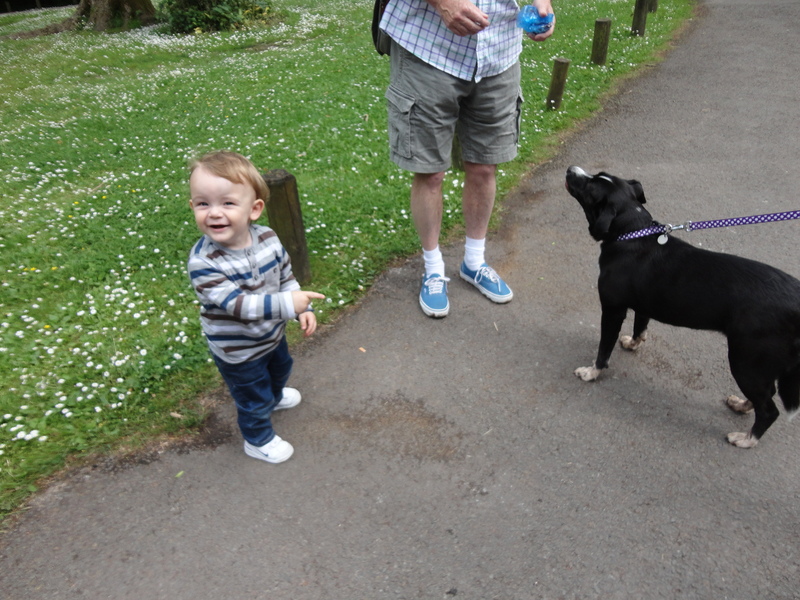 Offering his dog a biscuit he said ‘Say please…’ He laughed when both Alfie and the dog raised a hand/paw into the air and signed ‘please’. 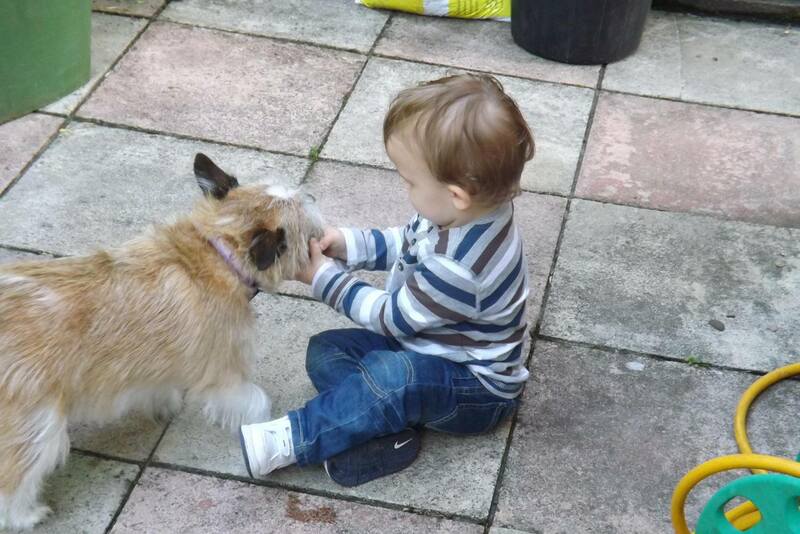 Jokingly the man offered Alfie a biscuit and was amazed when Alfie fearlessly fed the dog, often with his hand half way down the dog’s throat. 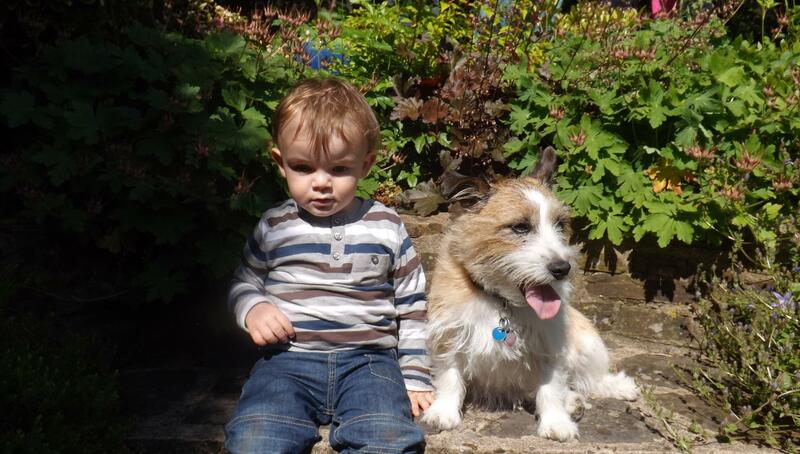 The dog’s owner was very impressed at Alfie’s love – and lack of fear – of dogs. 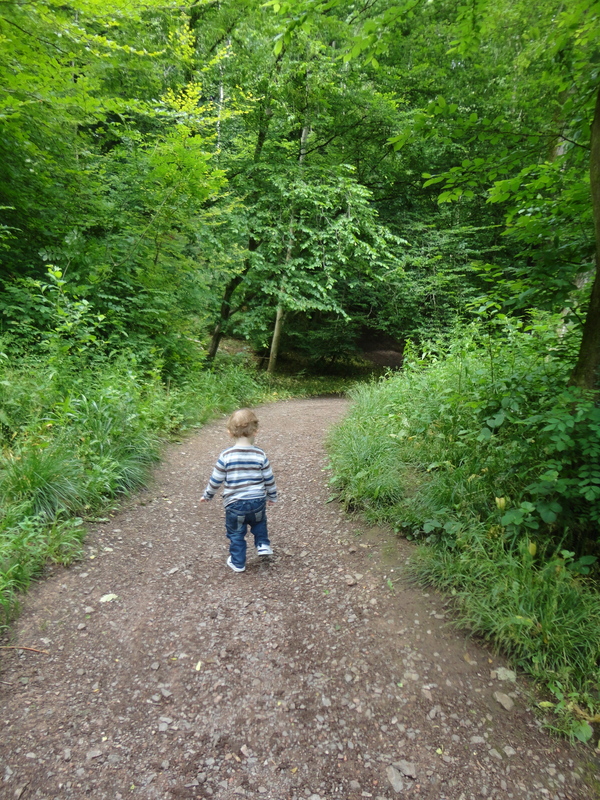 We then attempted the early stages of the Fforest Fawr circular walk but must come back another day to complete it all. 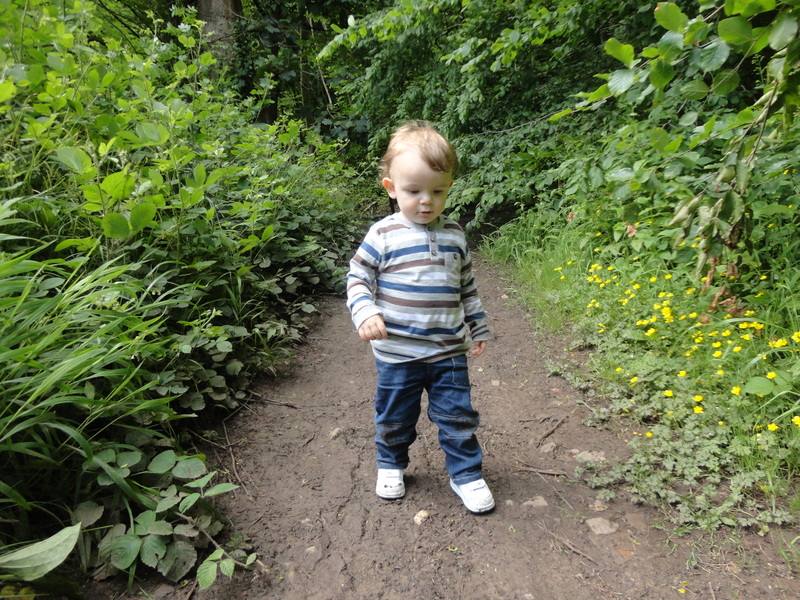 Alfie loved being at one with nature and explored every log and tree! I look forward to many other chances to get out into the wild! From here we had one last stop before heading home. It was Great Uncle John’s Birthday. 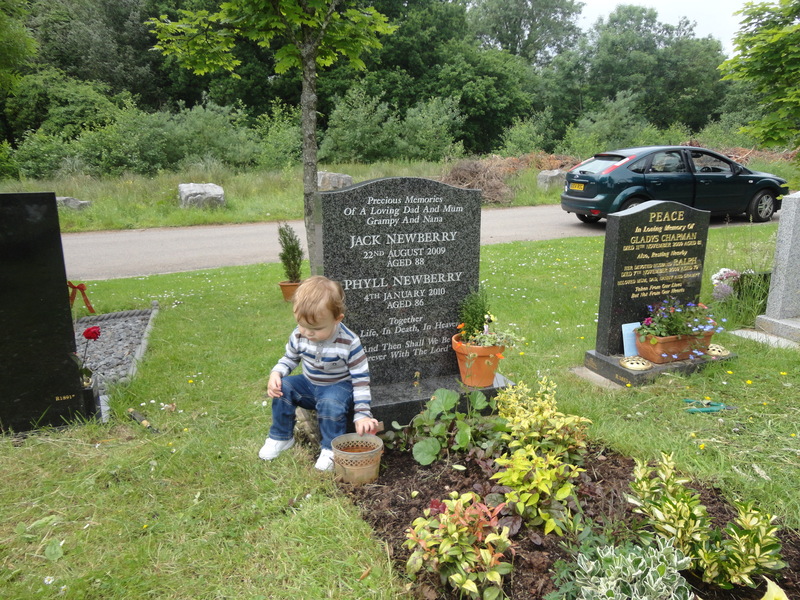 Before today John was just Alfie’s Great Uncle. 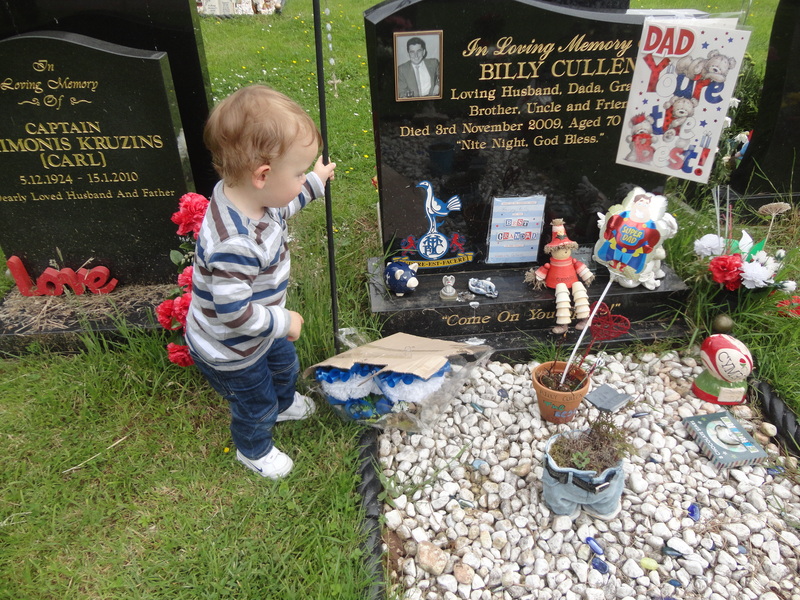 After our visit, he is now great Great Uncle John. 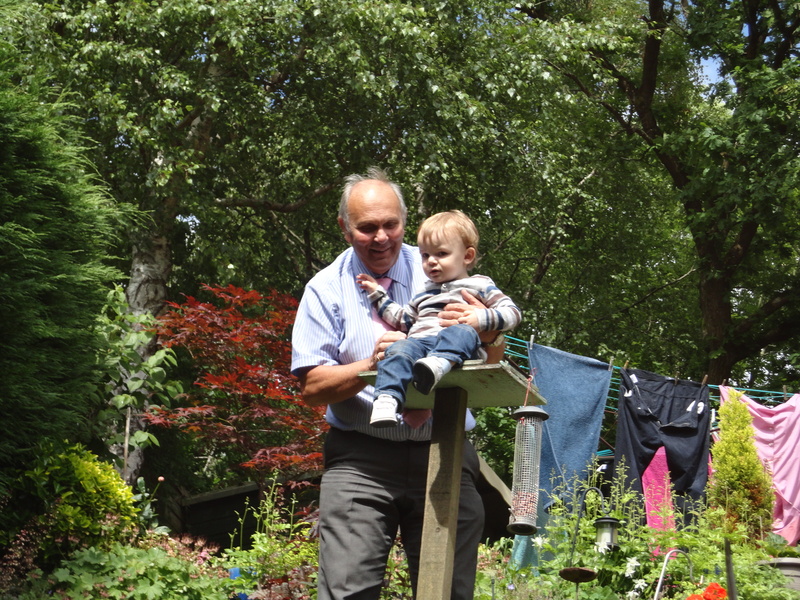 The old fella was wonderful with Alfie and took him to explore the upper reaches of Newberry Towers, the Welsh equivalent of The Hanging Gardens of Babylon and spent much time playing games and showing him how to throw the ball to Masie. 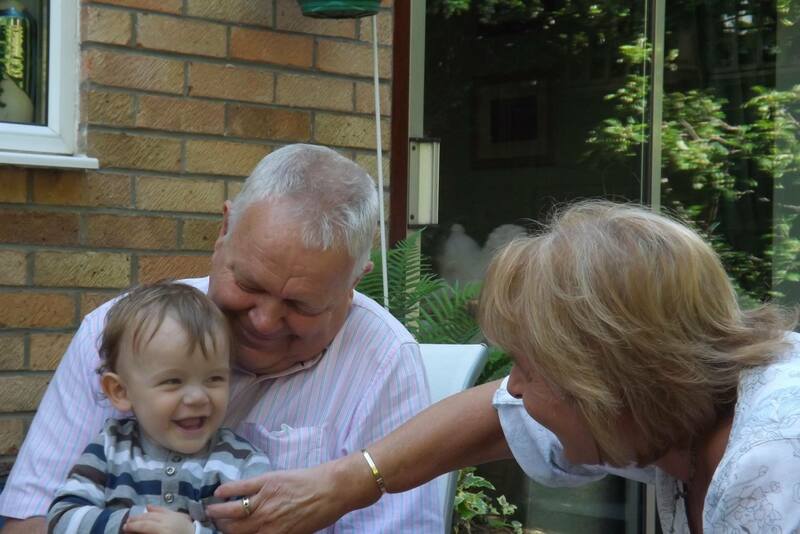 Both John and his good lady were so good with the little lad. He loved every single minute with them. It wasn’t long before Alfie had his hands down another dog’s throat, as he shared what was left of his crisps and sandwiches with the little dog and tried to retrieve the ball after Masie chased it on numerous occasions. 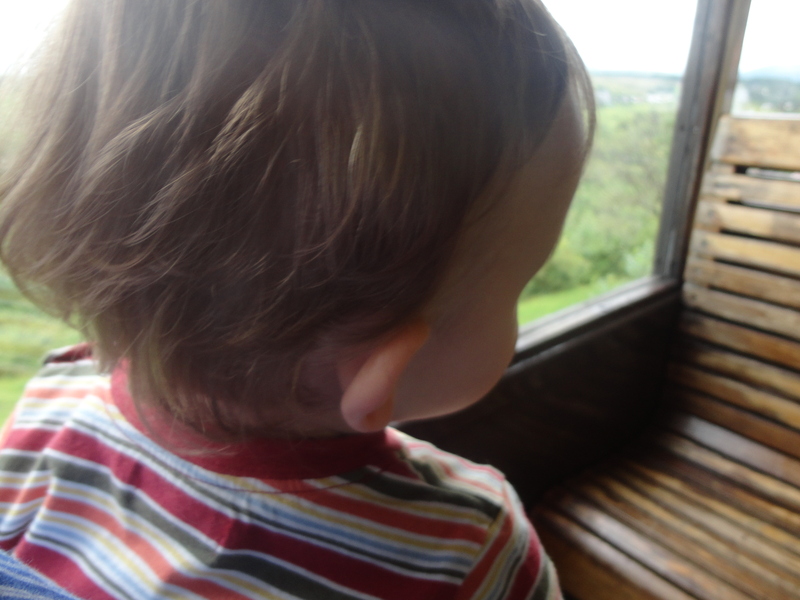 Soon it was time to go home, so I carefully placed Alfie’s hair back over the egg shaped lump that was still on his forehead, so that his dad and mum wouldn’t notice and we made our way back down the A470. My little friend was totally exhausted and we barely reached the M4 before gentle snores coming from the back told me he was reliving his exciting day in Dreamland. I glanced back at him and smiled, then I looked up and thanked God for such a cute little pal.